Do you ever wish that you can whisk the family off for a weekend getaway without the hassle of needing to book air tickets or having to plan for a kid-friendly itinerary? I know I have, and still do. Now, imagine there is a place that is just out of Singapore and accessible by a one-hour ferry ride, a luxurious hotel that makes a perfect haven to rest and relax, a platter of scrumptious food for you to savour, and a place where there are fun activities available for the family, both young and old, to enjoy. I think we just found this idyllic destination last month and there couldn't have been a better way for us to celebrate the Father's Day weekend. 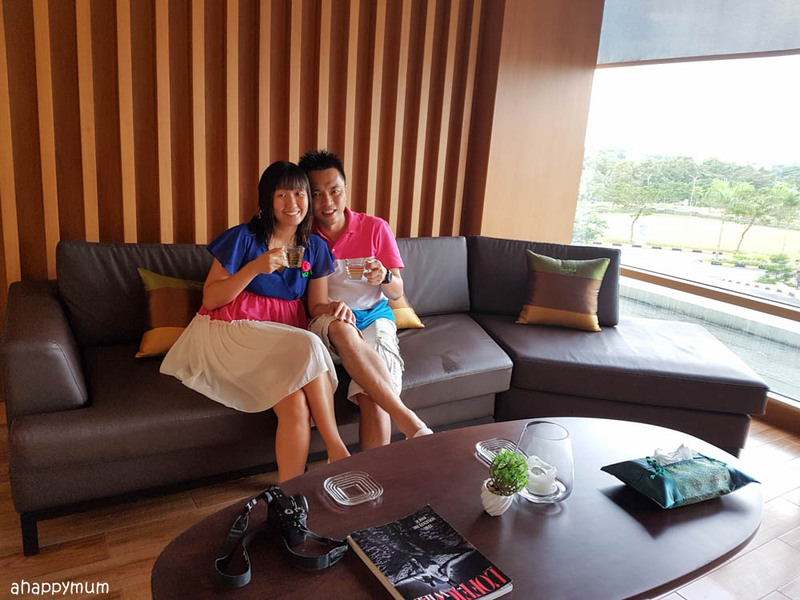 Yes, I'm talking about Radisson Golf & Convention Center Batam and this is the post that many of you have been waiting for. Today, I'll be showing you around the hotel and take you on a tour of its facilities, as well as share with you all the fun-filled, family-friendly activities that we did. I've also done a short video clip at the end so as to give you a better idea of what you can expect from this 4.5-star hotel too. You know how I always try to share the good stuff with you, right? 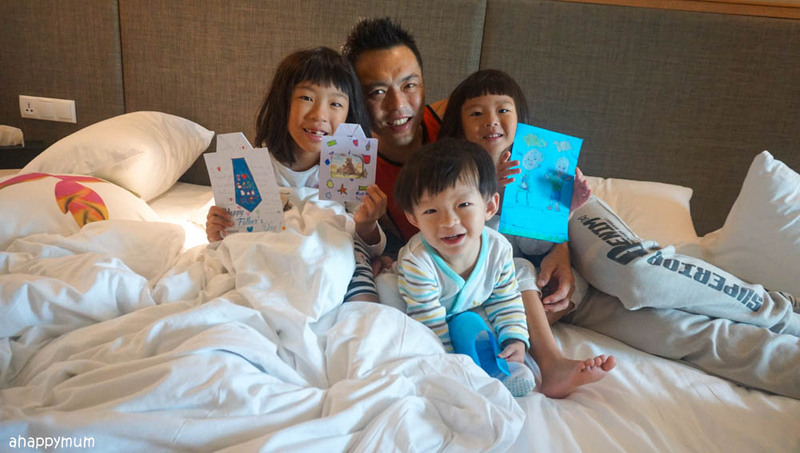 I've given away not one but two all-inclusive Club Med holidays, theme park tickets to Hong Kong Disneyland and a character dining treat in Disneyland Hotel, and three family packages in HARRIS Batam too. 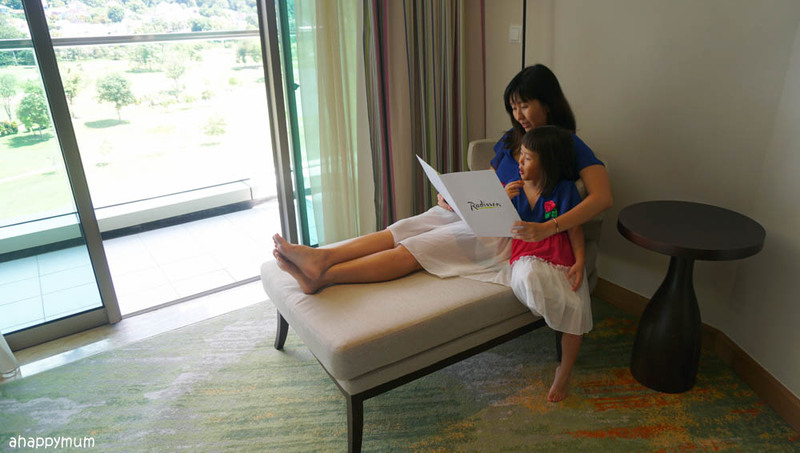 *drum roll* So, the great news is I am doing it again and I have an EXCLUSIVE GIVEAWAY just for my readers where two of you will get to win a 2D1N family stay in Radisson Batam - which is inclusive of breakfast, spa sessions and dining vouchers too! Sounds awesome, right? Let's get this started! 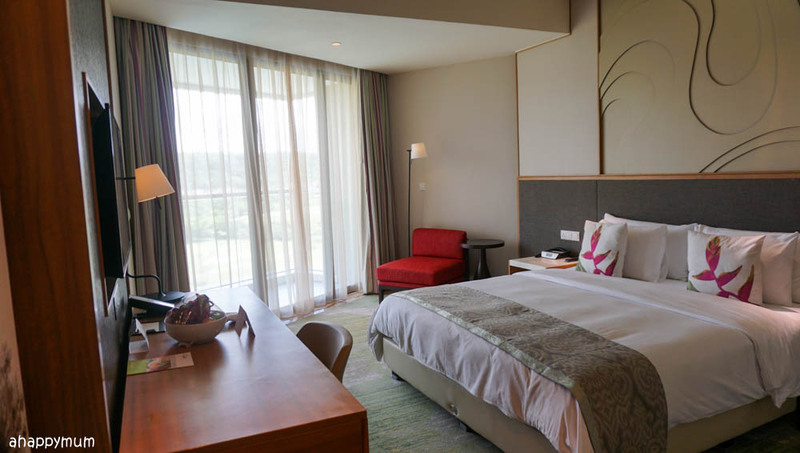 Situated in the upscale Sukajadi area, Radisson Golf & Convention Center Batam is a newly built hotel with 240 rooms and suites which opened doors in the third quarter of 2016. 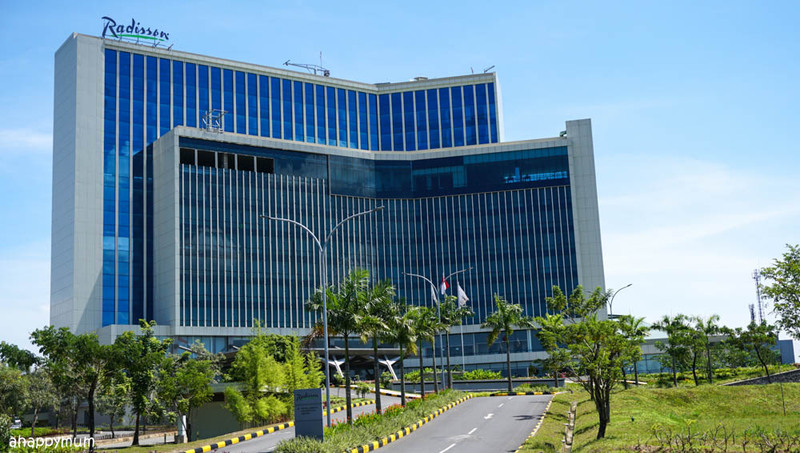 It sits within a walking distance from Kepri Shopping Mall and is 5km away from the Batam Center ferry terminal. 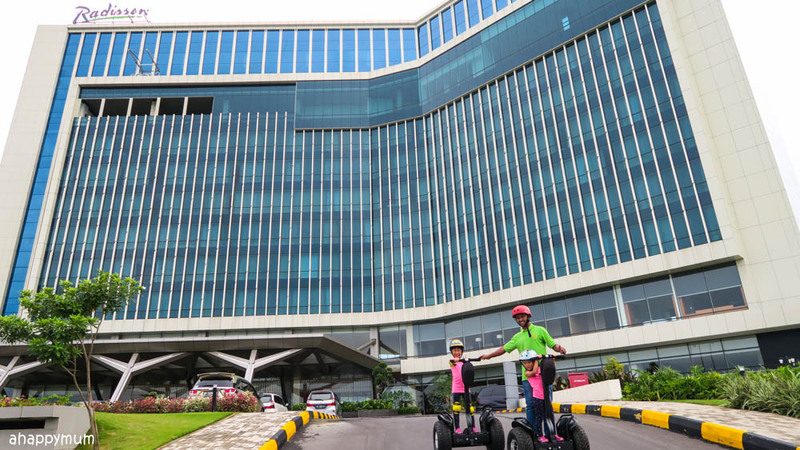 While it boasts vast meeting and event spaces, including a ballroom that can accommodate up to a whopping 1,600 banquet guests, what attracted us was how this plush hotel is family-friendly at the same time, offering facilities such as the Kids' Club, outdoor infinity pool and exciting on-site activities like archery and segway. I remember how tranquil it felt at a point and the hubby and I both wondered "Are we really in Batam Center?". Yes, Radisson felt like an oasis of serenity amidst the bustling city and it was where we could finally rest and relax (for a while, I mean, we are parents of three after all!) and look forward to having a great family vacation. The moment we came out of the ferry terminal, we were greeted by the Radisson staff who was there to pick us up and shuttle us in a private car to the hotel. We felt pampered when we saw that there were wet towel rolls for us to freshen up and mineral water to quench our thirst. In addition, our driver was so affable and we had such a nice conversation about anything under the sun that the 15-min ride felt too short. 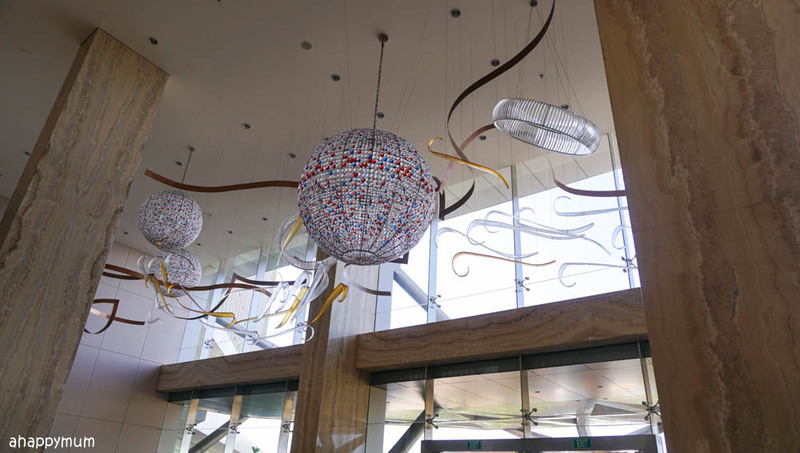 Once I stepped into the lobby, I was awed by the tall ceiling, the beautiful hanging pendant lights and the glistening swirls which added to the grandeur of the place. 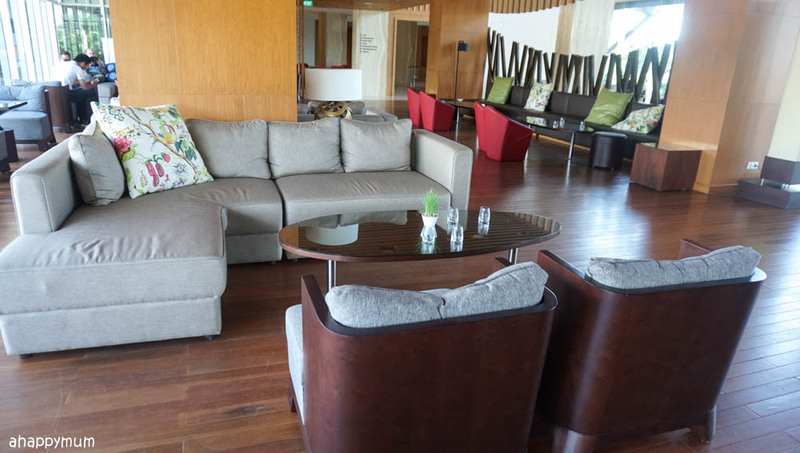 Besides having a cosy layout, the lobby also provided ample seats for hotel guests to rest their feet after a long travel. The natural light that shone in through the full length windows gave the place a warm ambience and made the whole setting homely and intimate. Other than feeling thankful for the chance to sit down on comfy sofas while waiting to check in, what stole our hearts most was the magnificent view. 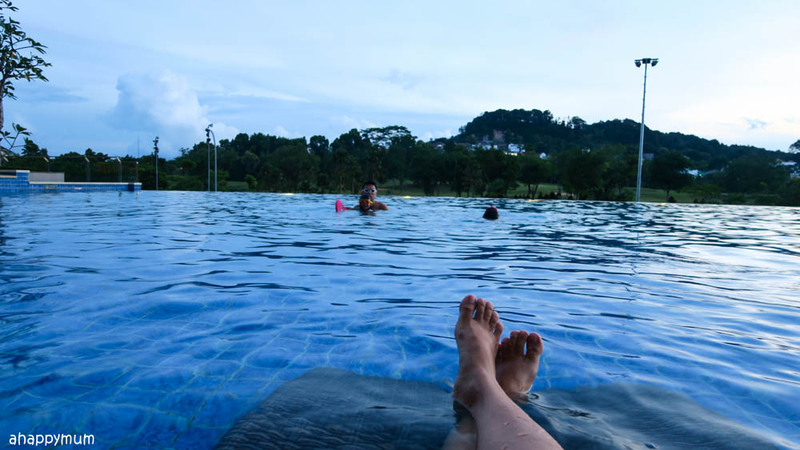 Yes, we saw the bright sun, lush greenery and a very inviting outdoor swimming pool! In fact, the kids couldn't wait to go for a splash because the weather was just too hot and a soak in the pool sounded so heavenly. While waiting to collect our keys, which was a very brief while because the check-in process was swift, we also did a toast with our welcome drinks - a deliciously fresh drink made with lemongrass and basil seeds. It was one of the rare times when we would sip welcome drinks till the very last drop, even the toddler gulped it all down, so you can imagine how much we liked it. Now, let's check out the rooms! I always feel this sense of anticipation when I walk into my hotel room for the first time during a holiday. How will the room look like? Will there be enough space for the kids to run around? How many beds do we have? How big are the beds? Is there a balcony? Will we have a nice view? 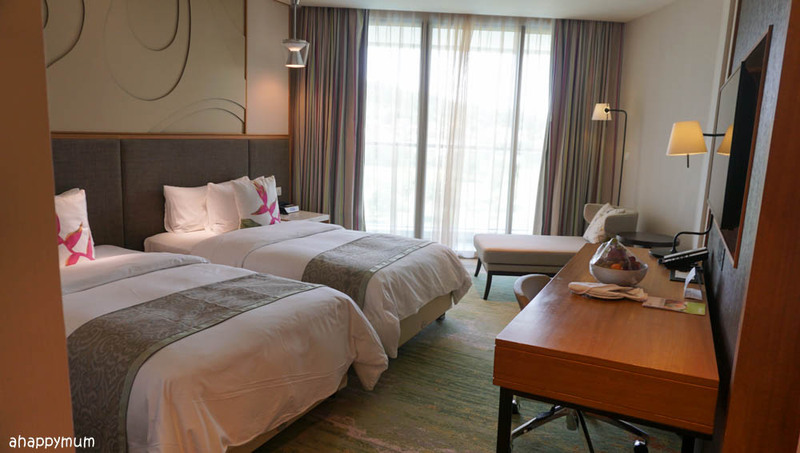 With Radisson Golf & Convention Center Batam being rated as a 4.5-star hotel, I suppose the expectations were even higher and we were very much looking forward to seeing our room. Or rather, rooms. Yes, we had two connecting rooms! 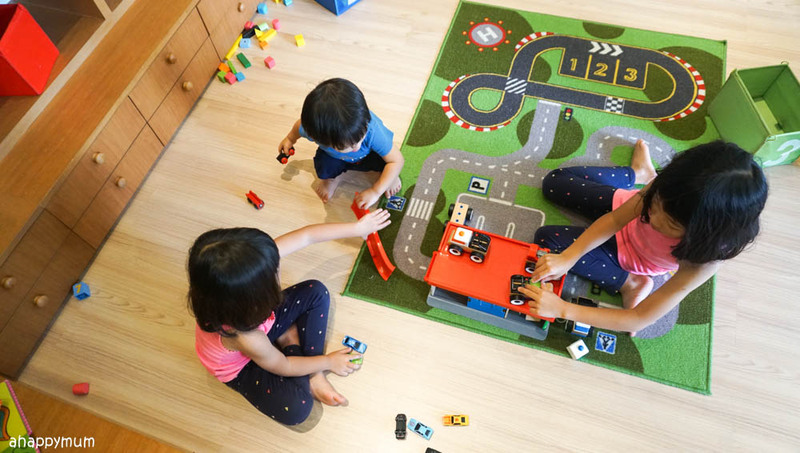 This is a very ideal arrangement for families with kids because while the kids can rest, sleep and watch cartoons in one room, the adults can watch more mature shows and enjoy a little privacy in the other room. Well, that is provided if you don't have a clingy baby (alas, I do) or kids who love to watch HBO movies more than Cartoon Network (I have not one but two of such kids). It turned out that we spent most of our time in the room together as a family but hey, isn't that what this holiday was all about? 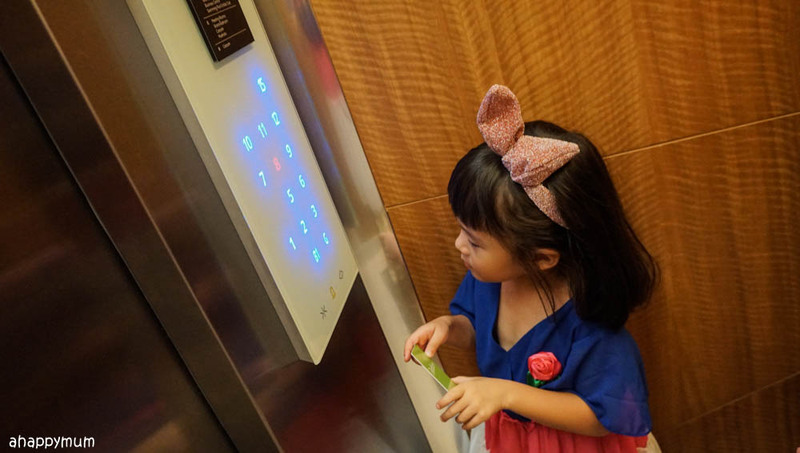 Anyway, what impressed us before we even reached our room was the elevator! Nope, it wasn't the fact that you needed to tap your room key before you can access the levels but the fact that the control panel was touch screen! Yes, that was something new to us and the kids were very intrigued by how the numbers would illuminate and give off that nice, blue glow. As for the rooms, they turned out to be more spacious than we needed and I was glad for that. We had a double bed in one room and twin beds in the other, which more than sufficed for our family of five. You can always combine the twin beds together if you prefer a bigger bed for the kids to share too. While the rooms might not be designed for kids - you don't see kiddy bedsheets or a toy corner, I actually appreciate the minimal yet sophisticated decor. The earthly tones, clean lines and wooden furniture reminded me of our Scandinavian themed home and since I wanted this vacation to be as relaxed as possible, I reckoned we were off to a great start. You know, I always try to bring an adaptor when we go on holidays because it might just come in handy and the reception might not always have one on hand. The thing is, I didn't need to for Radisson! Just take a look at the wall sockets and you will know what I mean. 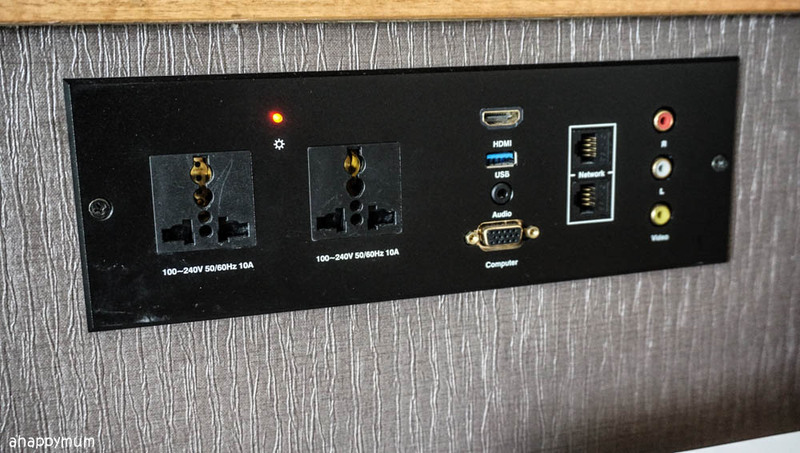 Yes, it's an universal multi plug socket which even includes HDMI, USB and Video, so you can basically connect everything you need without any hassle at all. If only all hotels have this, right? We were also greeted by a basket of fresh fruits when we stepped it, which marked a sweet, juicy start as the kids continued to explore the rooms. 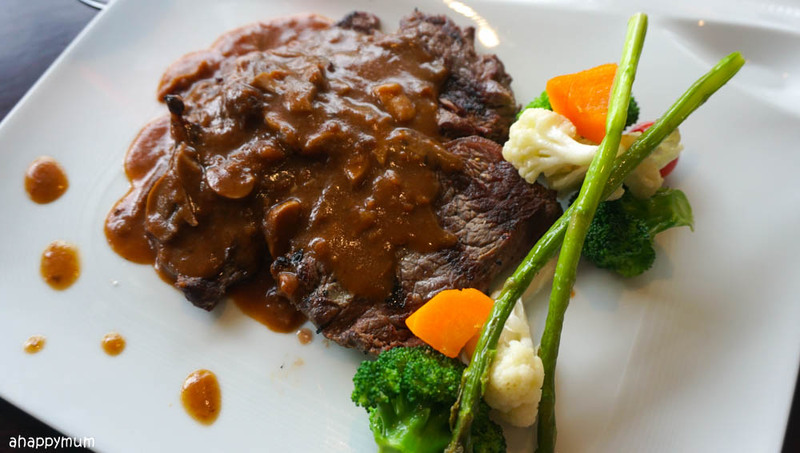 If you feel like having in-room dining in the comfort of your room or suite, the room service menu has quite an extensive list of food options to choose from too. As for the toilet, while the kids were a little disappointed to see that there was no bathtub, this was comforted by the fact that there was a wall mounted rain shower. Yes, how indulging! 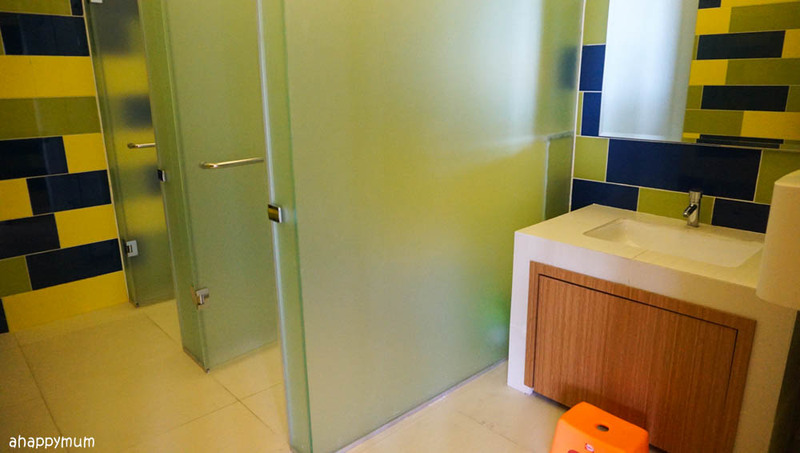 The shower area is also separated from the toilet and the spacious wash basin has everything you need, from towels to toiletries (which includes a facial soap bar) and even a weighing scale. 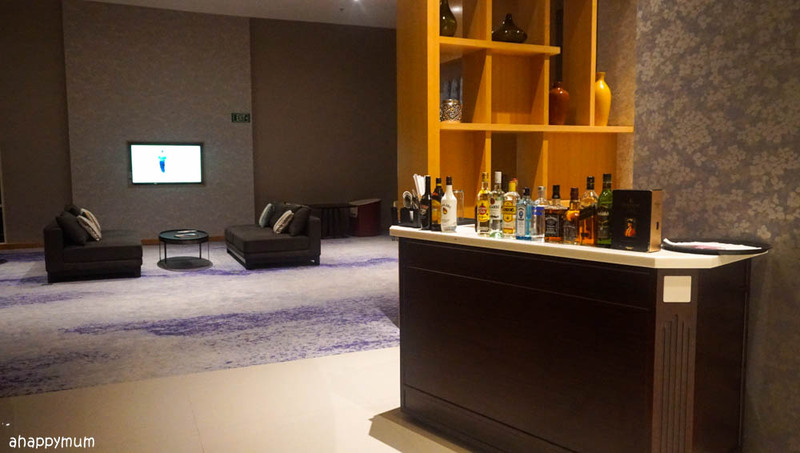 For those who like to have a quick drink or snack in the room, the fully equipped minibar offers coffee, tea, soft drinks, fruit juices, beer along with chips, nuts and chocolates too. 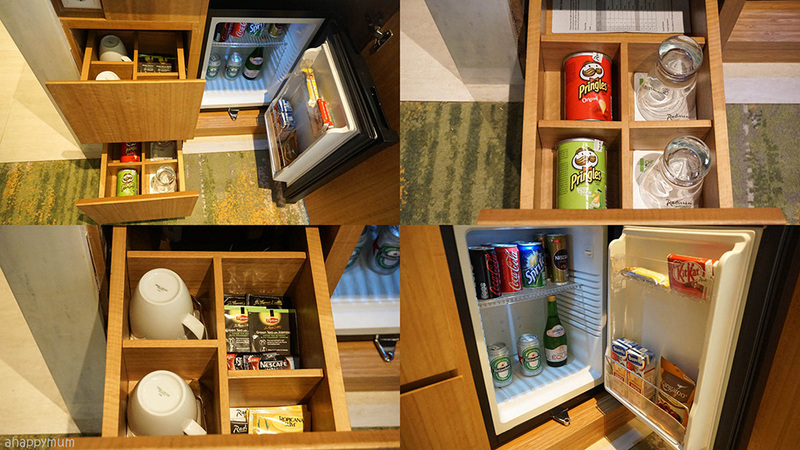 There is also a bar fridge so you can store items such as milk for the kids to keep it fresh. Coming to the balconies (yes, there is a balcony in each of our rooms! ), we couldn't have possibly asked for a better view. Overlooking the swimming pool and the Sukajadi golf course, the gorgeous panoramic view of the lush landscape was definitely one of the best views we've ever had in a hotel room. We even managed to catch a glimpse of the sunset too on our first day and it made our lovely day feel even more incredible. 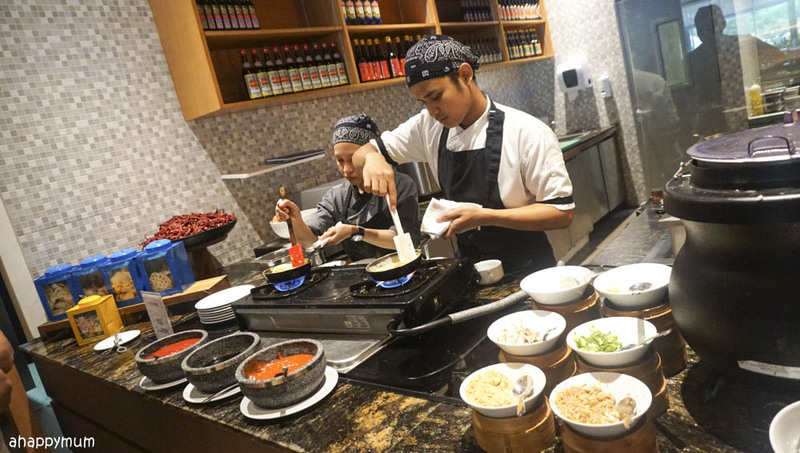 Even though we might not be food connoisseurs, it is still true to an extent that the quality of food served in a hotel can make or break the vacation. 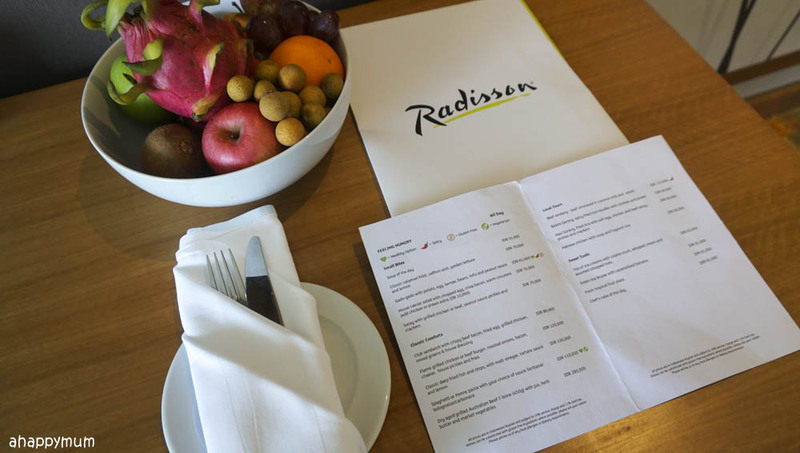 So, we were very excited to try out the menus in Radisson and see for ourselves just how they live up to standards. This is the main restaurant in the hotel which opens all day from 6:30am to 11pm. 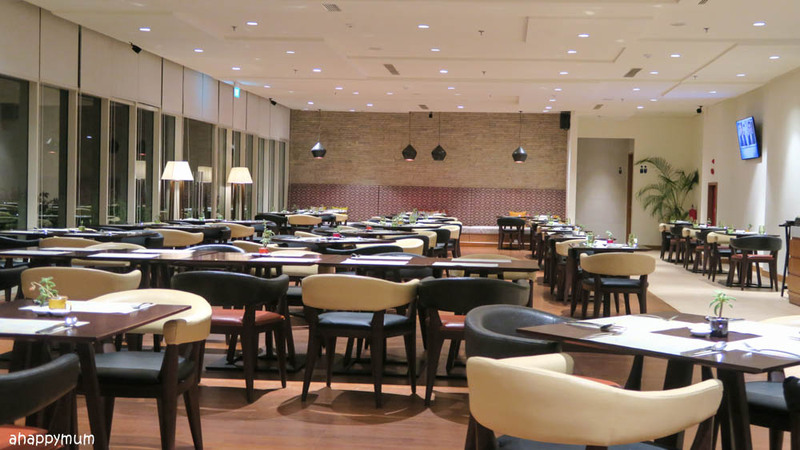 Consisting of 152 seats, you can choose to have your meal indoors in the comfort of the air-conditioner or go the al fresco way. I love how the natural light shines in to give the place an airy, bright and cheery vibe, which definitely makes me look forward to my meals even more. 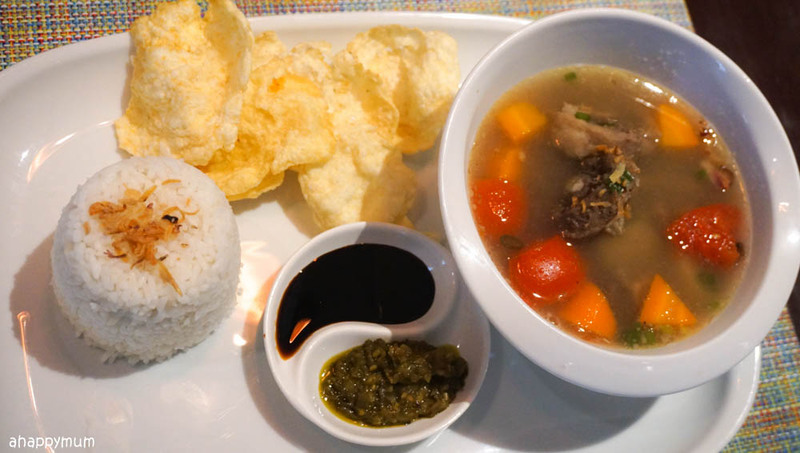 The restaurant offers international cuisine but the main highlights will be Western and Indonesian dishes. 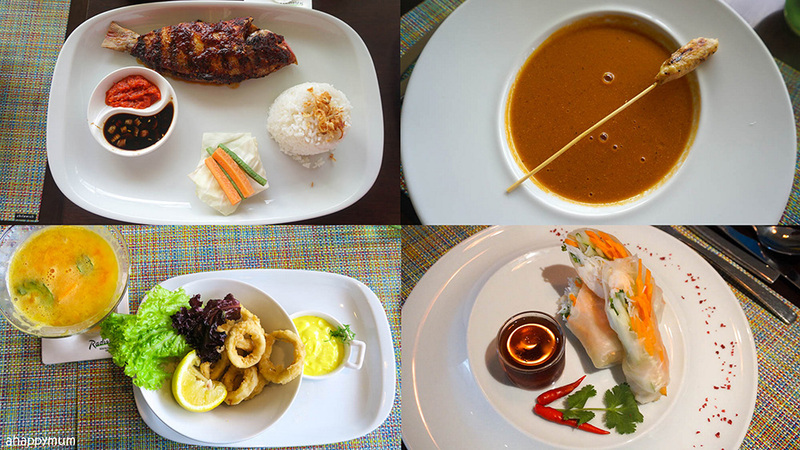 The ala-carte menu is tantalising and offers a wide variety of options to satisfy your food cravings. 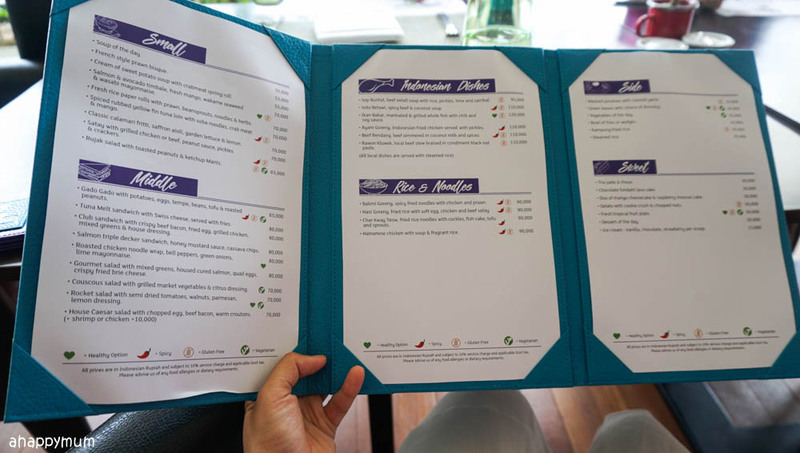 Even though the menu is fixed, we still felt like we were spoilt for choice at every meal and I wished we could have tried out more than we did! 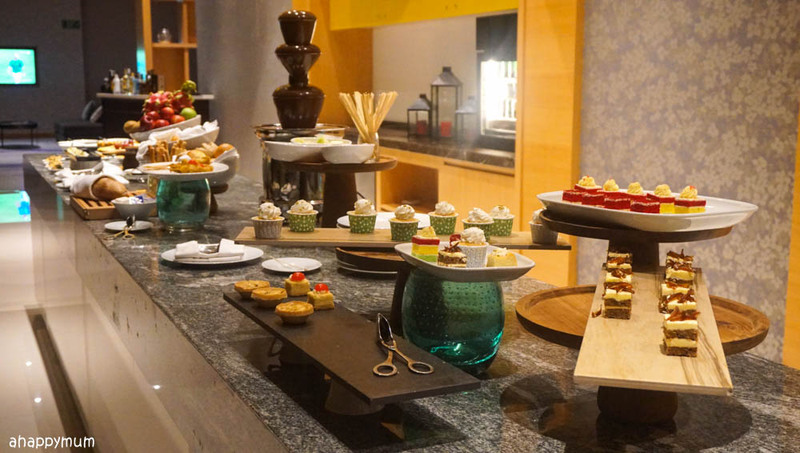 On special occasions or festive celebrations, hotel guests can also get to enjoy a buffet spread during dinner time. 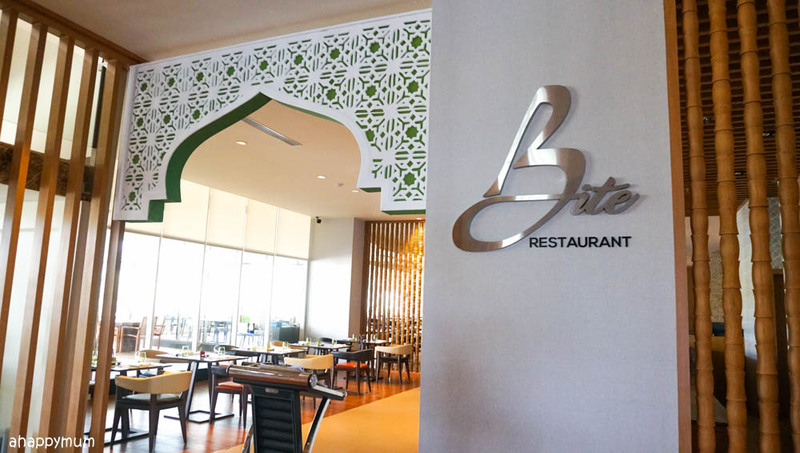 We were there at the Ramadan period and were treated to a sumptuous all-you-can-eat buffet dinner too. Yes, lucky us! More pics on that later. 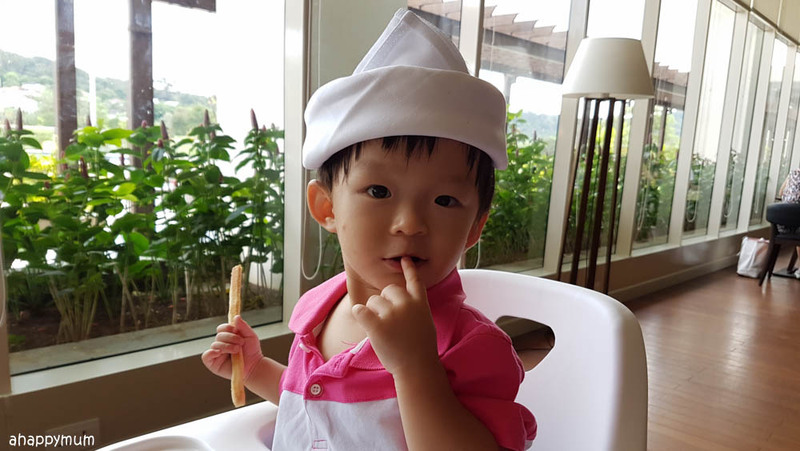 Now, if you have young children, then you know the feeling of how you need to order your little ones' food before you can even sit down to tuck into your own. Yup, I have three little beings to handle, and thankfully they can usually feed themselves. I was initially a little worried if they would take to the cuisine here because these fellas usually eat Chinese food and love noodles, soup, fishballs, rice and so on. 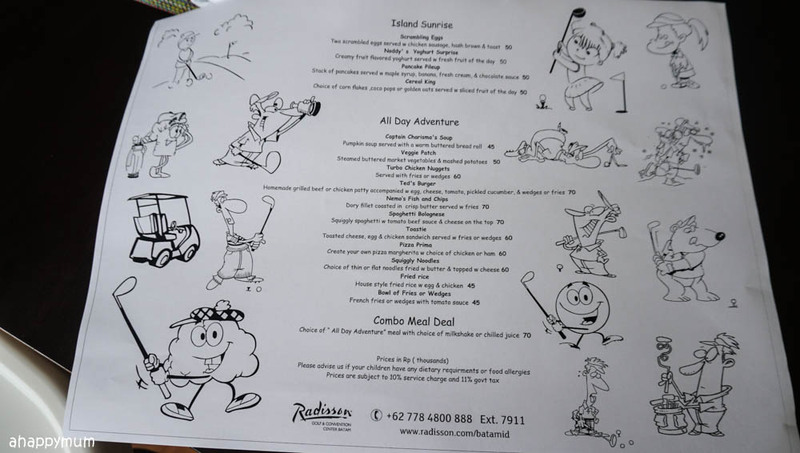 Thankfully, there was a kid's menu at Radisson and even though I didn't think it was an extensive one, it sufficed to keep our kids happy at every meal. 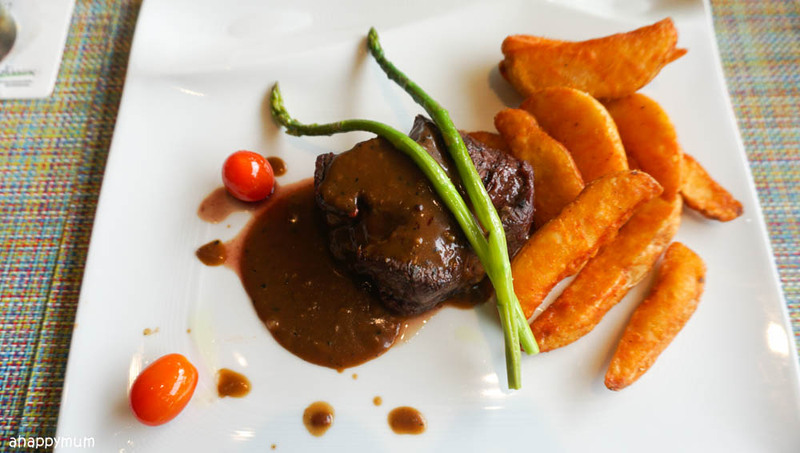 The spread was generally Western cuisine and included food items such as nuggets, fish and chips, spaghetti bolognese, burger, sandwich, fries and so on. 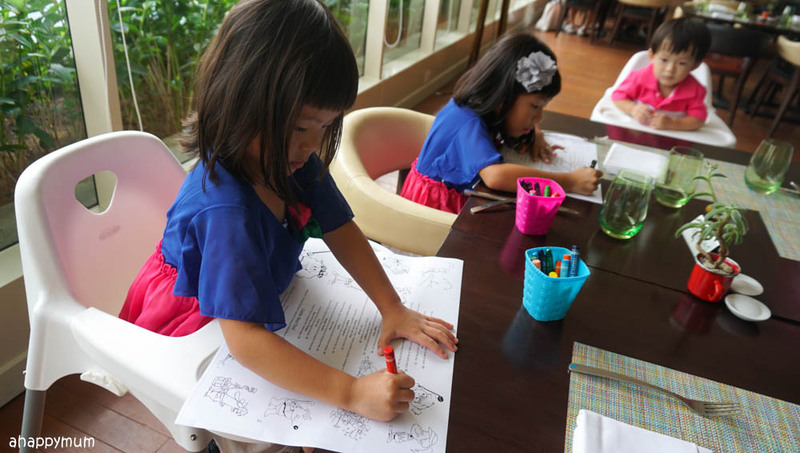 What delighted the little ones most of all was that they got to colour on the menu every time they were in the restaurant. 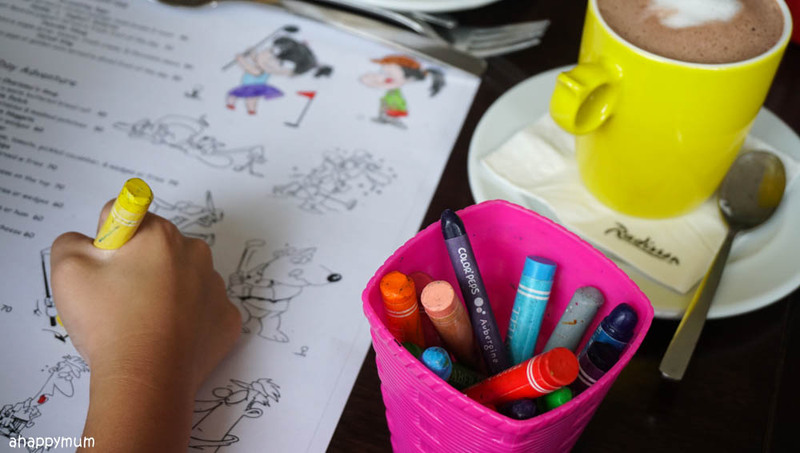 Yup, the staff would pass each of them a cup of crayons and they would start colouring away, giving us a little peace and quiet to go through the menu and make our orders. 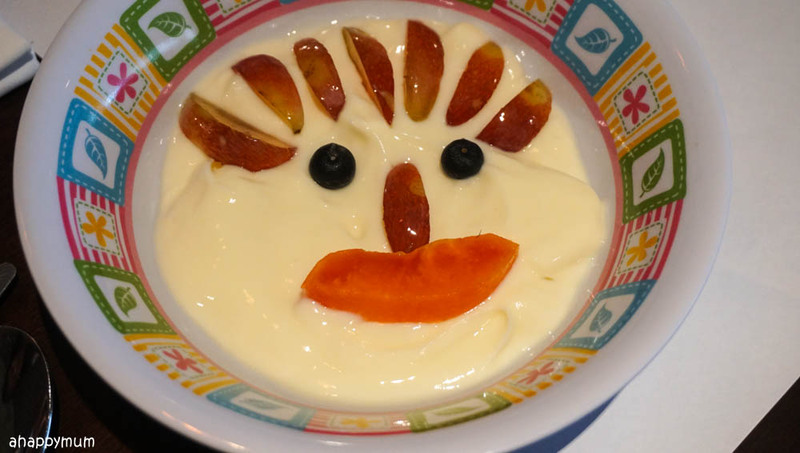 What I appreciated more was the service and the attention to details - for instance, Asher's yoghurt had a smiley face made of fruits. The waiting staff was also very patient and kind as to accede to any need or request that we, or rather, the kids, might have. 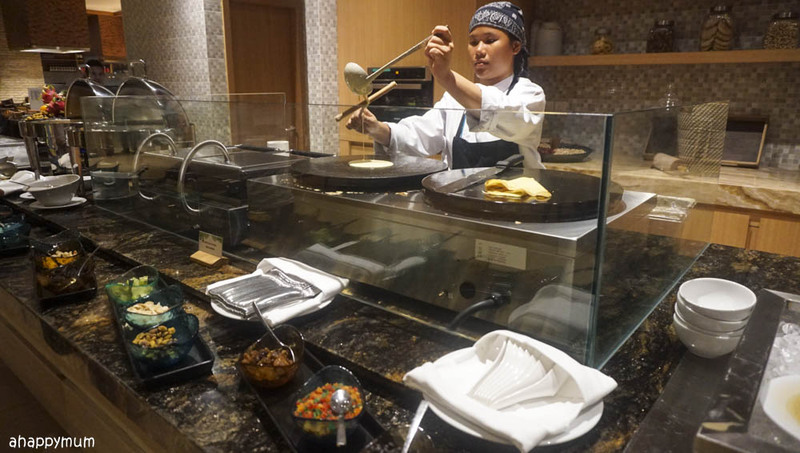 For the breakfast and dinner buffet, what we loved best was the live cooking stations! Yup, besides the commonly seen omelette and sunny side up station, we also had waiting staff preparing pancakes, crepes and waffles at breakfast time. Come dinner time, you can either order your own Mee Ayam, Gado Gado or Spaghetti Bolognese and watch on as the waiters prepare your food on the spot. Talk about freshness! 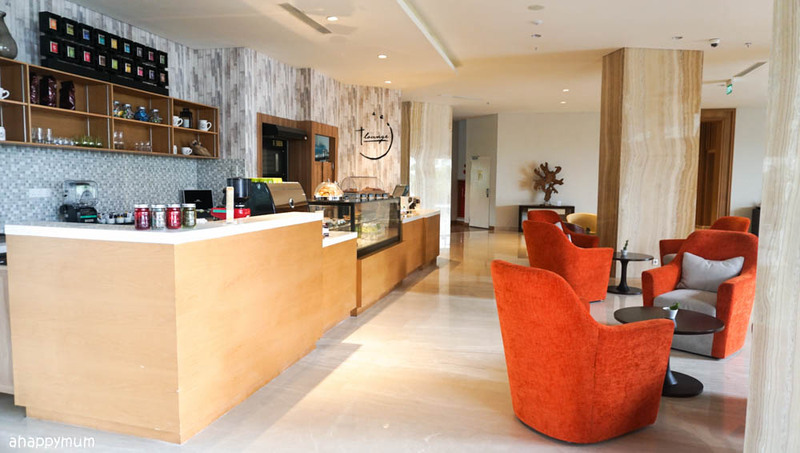 If you need a coffee, tea or just a sweet treat, the T-Lounge will make it very convenient for you. It is located on the ground floor and opens from 7:30am to 10pm. 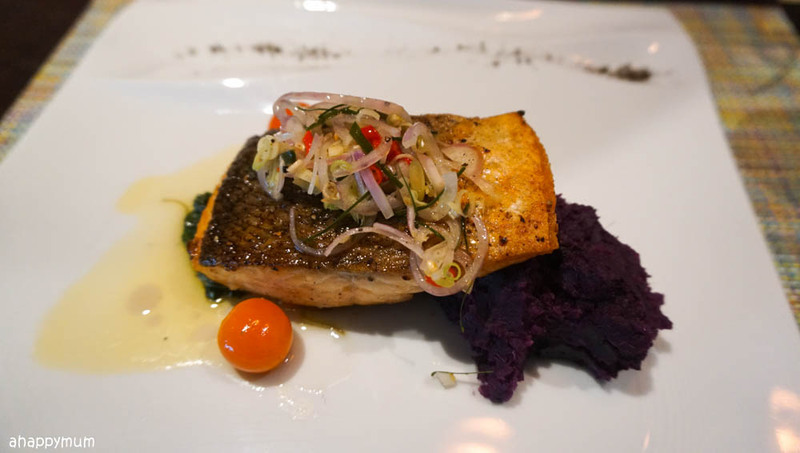 As much as we love a delicious meal, there is only so much time one can spend on eating and drinking, right? For the rest of the day, we prefer to check out the facilities in the hotel and make the most of them. Here are some of the facilities you can expect to see in Radisson. Hands up if your kids love to be in the water! Mine do and if they could choose, they would probably just want to stay in the swimming pool all day all night. The infinity pool here was so nice to soak in and we loved the breathtaking view so much that we came here not once, not twice but thrice during our stay. I liked that there were a couple of huge sofas by the pool and an abundance of pool loungers too. What amazed me most was how the hotel staff came over to cover up the loungers when it started to drizzle and how they would take the initiative to come by and help us open the pool umbrellas when the hot sun was too much to bear. 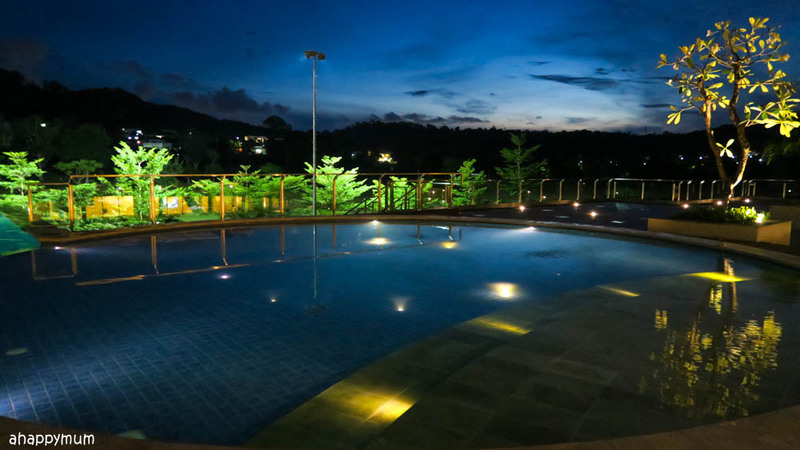 When the sun began to set and night time fell, there was this alluring, calming quality about the pool and I can honestly tell you that if not for the kids, I would have loved to come here for a night swim and just enjoy the tranquility of the environment. 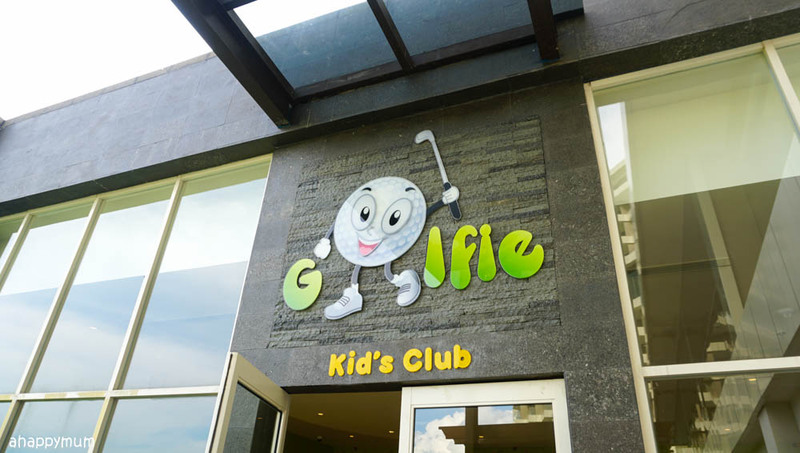 Some of you have been asking about this, so here's sharing more about the Kid's Club. Now, if you've been to cruises or Club Med and seen how their kid's clubs work, then this is nothing like it. 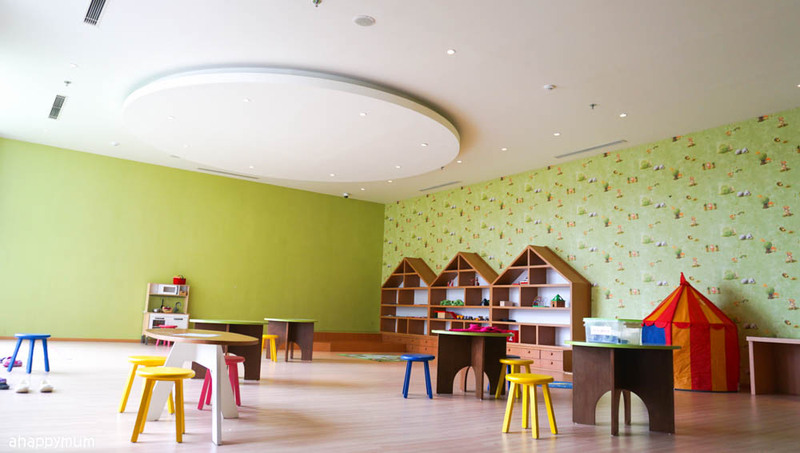 Don't expect an array of carefully planned activities designed to engage your child or think that you can just dump the kids here and go off for a day (the hotel does provide babysitting service if you need, do check with them at the concierge when you check in). This is how the Kid's Club looks like. Yes, it's basically a huge room filled with toys, books, card and board games, colouring materials, a television and kids' furniture. The good thing about the location is that it sits right beside Bite restaurant so if you would like to have a cuppa after your meal with the hubby, send the kids over and you can get peace for a while. Golden peace. I know, it might not look like a lot and I personally felt so too when I first stepped in. 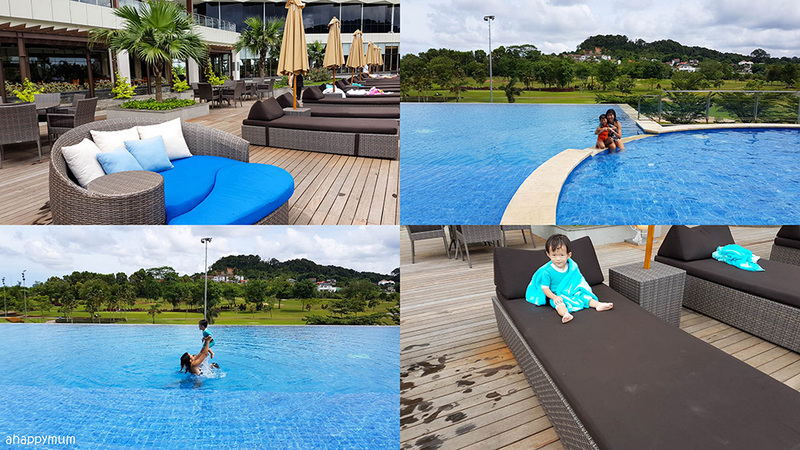 The ironic thing was that my kids were contented to play here for a couple of hours each day and it even gave us a chance to go for a couple spa session (one of the marketing staff helped us keep an eye on Asher), which was a once in a blue moon treat for the hubby and I. 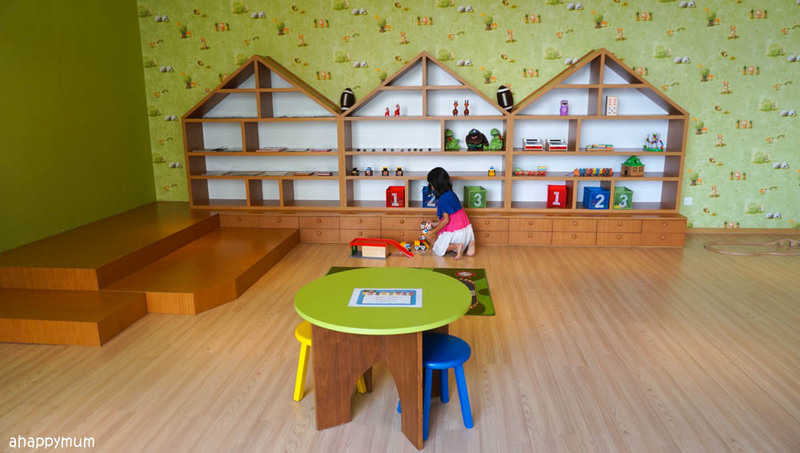 What the kids loved best in this room were the pretend cash registers, wooden kitchen, toy cars and car track carpet. 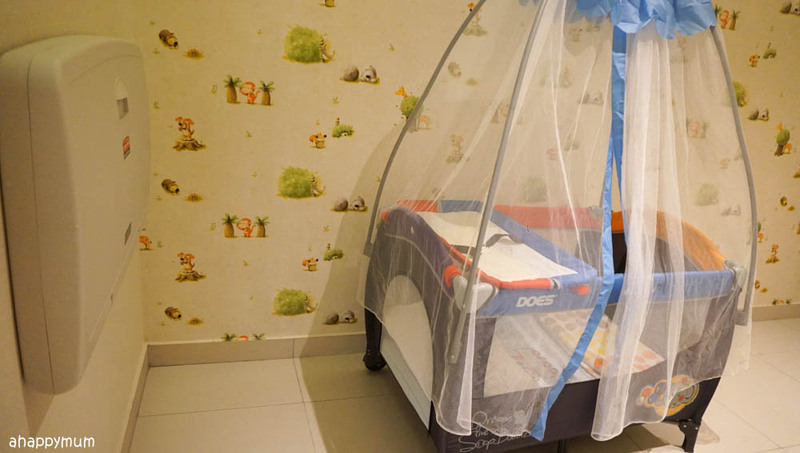 For those with infants or babies, there is a changing station and baby cot in a separate room inside the Kid's Club for you to make use of. There is also a toilet right within the Kid's Club premises for the little ones to use. The last I checked, it was all clean and there was a stepping stool for the kids to use in washing their hands. A couple spa is the perfect escape for well-deserving parents to unwind and rejuvenate their souls, don't you agree? I knew I was very much looking forward to this spa session because it's very rare for me to find time to spend with the hubby sans kids, plus my back and shoulders were aching like mad recently so I couldn't wait to have a relaxing massage. While the hubby chose a Swedish massage, I opted for an Aromatherapy body massage - which I was told was stronger than the Swedish one. I actually wanted a traditional Thai massage but that would have meant that I would be in a separate room lying on the floor mattress instead of on a bed in a beautifully decorated room meant for loving couples. So, I decided togetherness was much more important. It might have been just a short one-hour treat for us but it sure felt heavenly and very much revitalising. Yup, it was really a break I needed and I welcomed it with all my heart without feeling the guilt. As for the hubby, you wanna know how much he enjoyed it? Well, he fell asleep barely halfway through, which I think says it all. The business lounge is located on Level 12 and guests can look forward to watching a game of football here while chilling out over drinks. 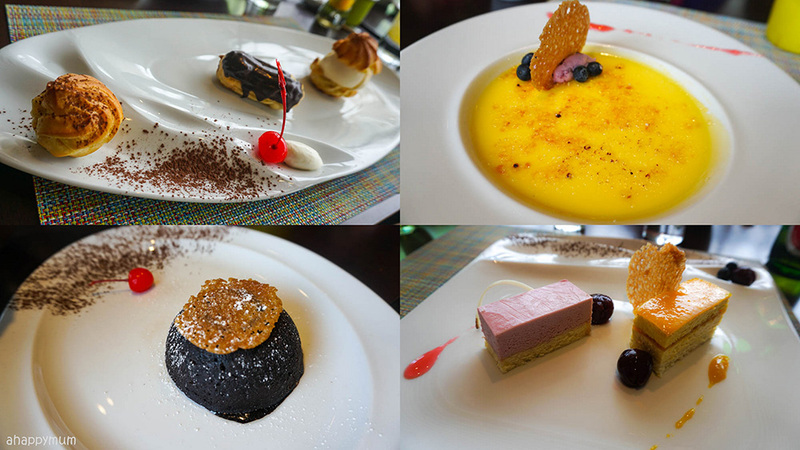 On Fridays and Saturdays from 5:30pm to 10:30pm, the Pop Up Bar offers an "All you can eat" menu including cakes, tapas, desserts, pastries and fondue, where you can indulge while enjoying the live saxophone and keyboard music performance. We did wish that there was a live band, though it might have jolly well disrupted the peace and quiet that guests of this hotel have come to appreciate. 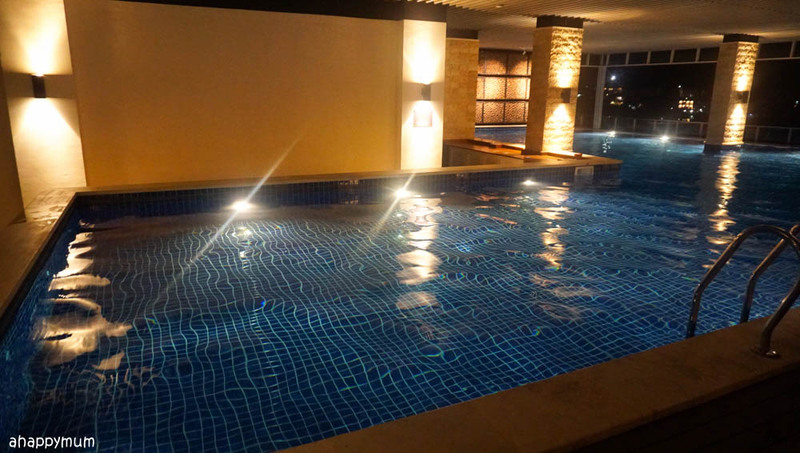 If the weather gets bad, there is also an indoor pool located here in the lounge. Just make sure that you keep the little ones in check and don't be surprised if the water is freezing cold too! The good news is there is sauna available in the toilets right outside. Yay! 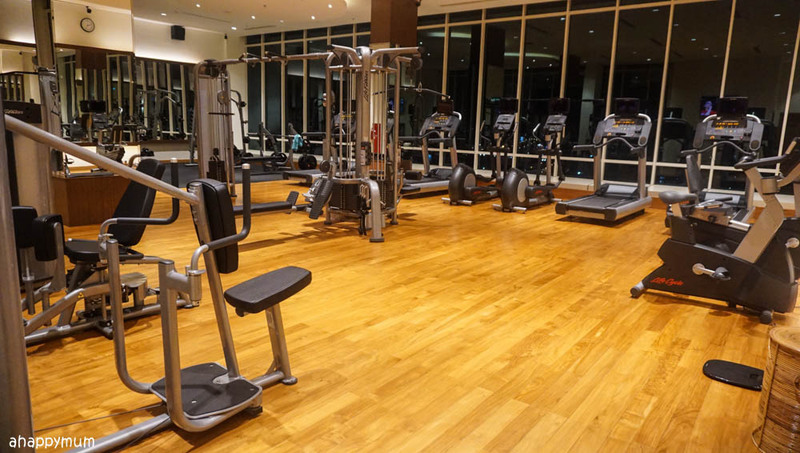 The Fitness Centre, which is also on Level 12, is of a decent size and has the typical exercise equipment you can find in a gym. It is, however, out of bounds to guests below 12 years of age so you will need to wait till they sleep or take turns with the partner to go for a workout. A main highlight of our trip was... playing GOLF! This was a first time for the kids and myself, and out of all of us, only the husband has some knowledge and experience in this luxury sport, thanks to his stint in Sweden. What makes Radisson the ideal place of stay for golf lovers is that it sits right next to the 18-hole Sukajadi championship golf course. Yes, it takes you just a couple of minutes to get there, how quick and easy! While I think the hubby was contemplating to play all 18 holes, or at least 9, on our second morning, he decided to be the best Papa on this Father's Day and spend time with the kids instead. So, we were very happy to just go on a tour of the golf course in the buggy and we chose to hone our driving and putting skills instead (yup, driving and putting as in golf terms, which I only learnt of during this trip). It took us merely five minutes to ride in the buggy from the hotel lobby to the Sukajadi Driving Range. 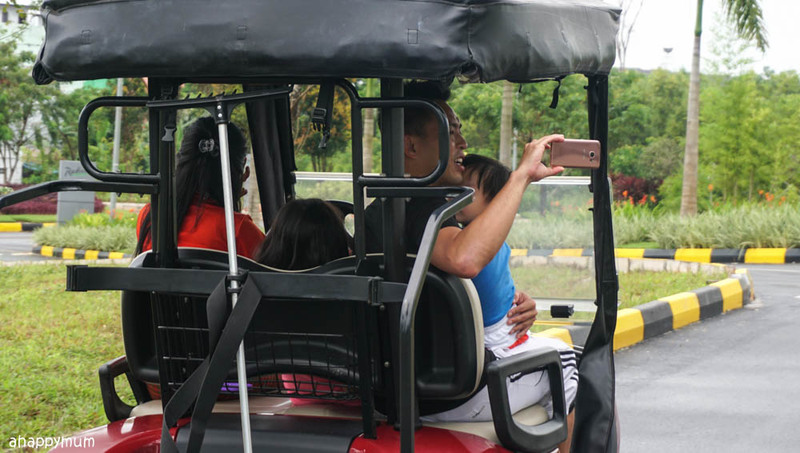 It was the first time the kids could sit in a golf buggy and they were very thrilled though they still didn't really know what activities awaited them. 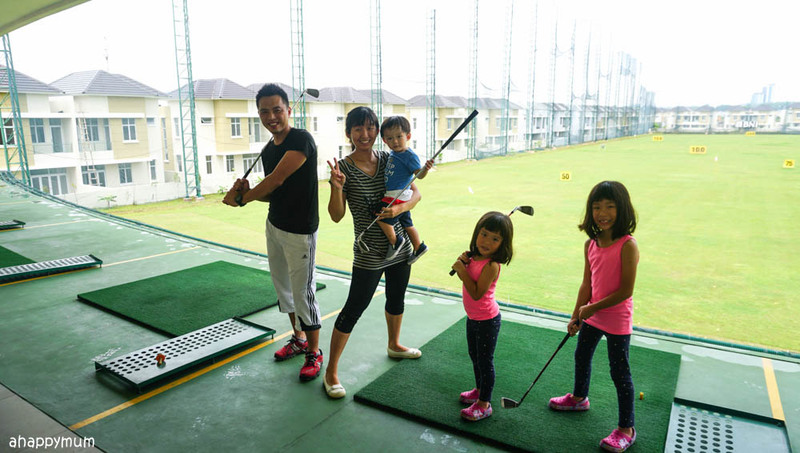 At first, I was all ready to stand by the side and look after the kids while the hubby worked on his swing and driving techniques. However, the staff brought us a bucket of balls and passed us some kids' sized clubs which totally thrilled them and they couldn't wait to start swinging too. So, each of us received a one-on-one coaching session from the hubby and I must say it was quite incredible that all of us managed to hit the ball at the very least. After that, we were all psyched up for more golfing fun so we made our way to the putting course. Even though the sun was blazing hot that day, it didn't deter us from putting some balls into the holes! In fact, the hubby saw how my shots went in on the first try and said I had potential, woohoo! I have to say that golf turned out to be more fun than I had expected and I loved it that the kids had the chance to try it out too. 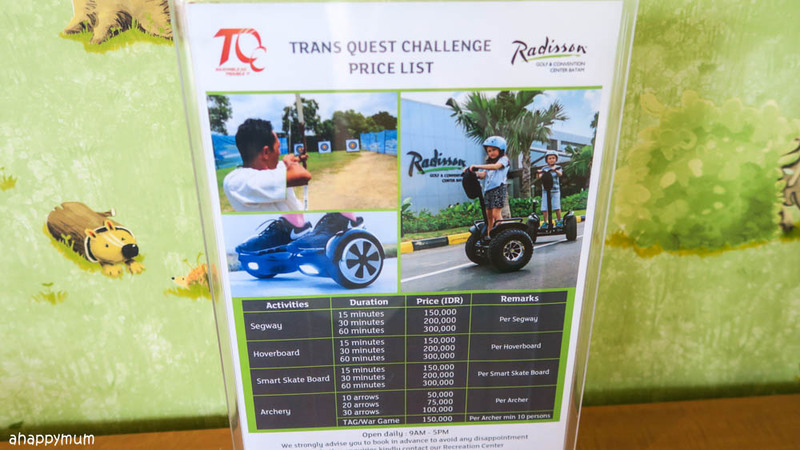 Moving on to the last few highlights of our stay, here are the on-site activities that you can participate in Radisson - Segway, Hoverboard, Smart Skate Board and Archery. The Smart Skate Board didn't really impress us because it's basically a motorised scooter, however, we wanted to try out the rest of the activities and we did! 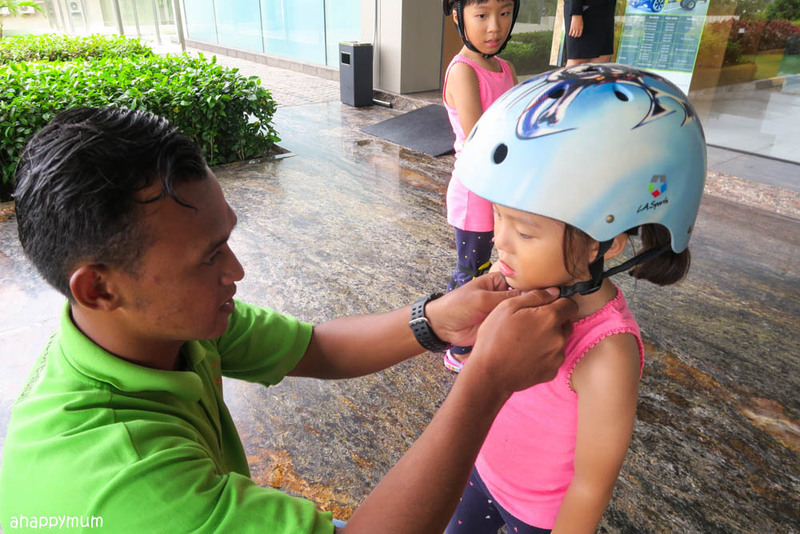 Even though there were minimum age limits for some of these on-site activities, the recreational staff was very accommodating and he became the guide for the kids so that they could have the chance to try. This wasn't Angel's first archery experience but it was for the little sister so she was thrilled that she finally got a chance to aim for the bull's eye. I have to say that archery is much more tiring than it seems and my right arm started to ache barely after a couple of rounds of shooting. Yup, maybe it's just me, oh well. It was really fun to try and aim at the target and any time the arrow landed on any part of it, the girls would let out squeals and you could just hear the joy in the air. This was what the girls loved most and it was definitely a memorable experience for them - the Segway! Yes, I was wondering if the girls would be able to do this and the guide was so kind as to teach them the basics, let them try controlling while never letting them out of his arm's reach. There was also a set of protective gear (yes, just one set to share) which included a helmet, knee guards and elbow guards. The big girl actually learnt how to ride the segway in just a few minute and she could make it go forward, backward, left, right or turn one round with ease. Yes, it felt very firm and stable so as long as she didn't accelerate too fast, she had no fear of falling. As for the little sister, she was also very daring to try and she loved every bit of the experience too, so kudos to both of you! As for the hubby, he hasn't had a chance to try the hoverboard prior to this trip so given that it was Father's Day that day, I guess this was a wonderful gift for him. Being the sporty, fast learner that he is, he didn't even need the guide to give him any instructions and off he went balancing and maneuvering his way on the hoverboard. Right, so easy meh? So I thought I would give it a try and up I went, time and again, and down I came in just a matter of a few seconds. Every time. Oh well, shall leave this job to the man. The whole experience might have been just a swift half an hour or less but I believe that it gave us memories to last for a lifetime. 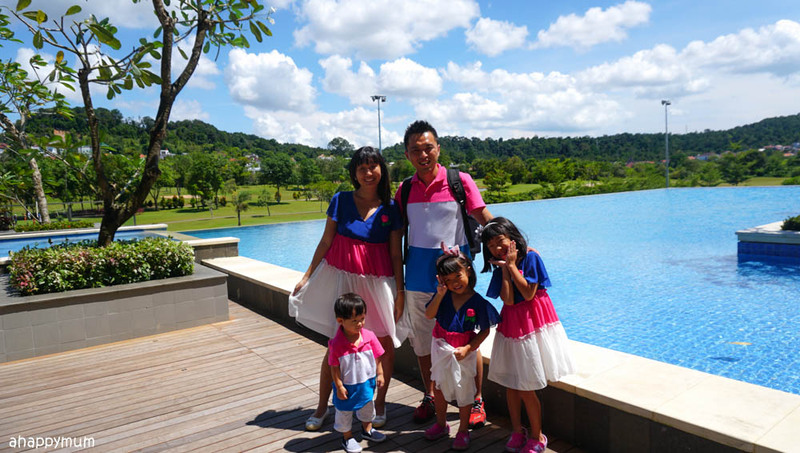 All in all, we had such a fabulous family getaway in Radisson Golf & Convention Center Batam that the kids have been asking us when we would go back again. 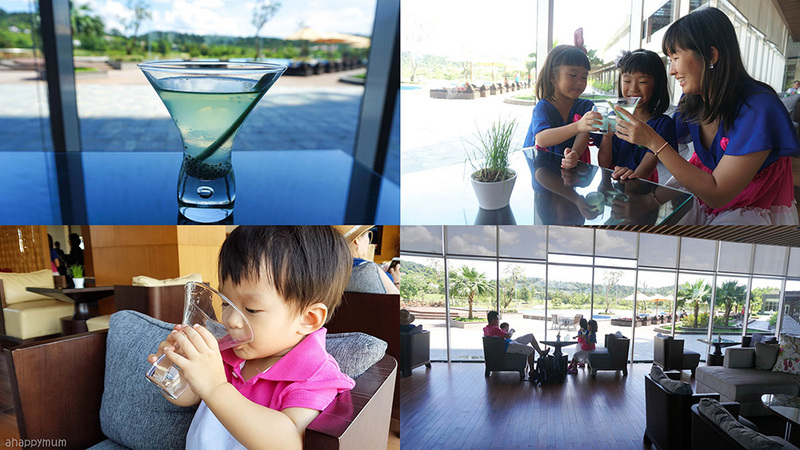 This was definitely a peaceful yet fun-filled, homely yet luxurious family holiday for us. Thank you, Radisson! 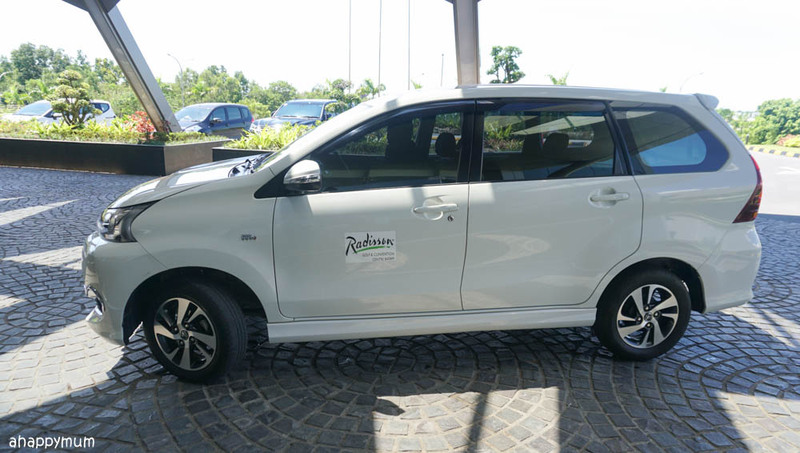 Here's a video that sums up our experience in Radisson Golf & Convention Centre Batam, watch it to have a tour around the hotel and check out all the fun activities we did! To participate in the giveaway, leave a comment in this blog post with your name, email address and tell me what you look forward to most in Radisson Batam. Indicate in the widget that you have done so and to increase your chances of winning, you can choose to carry out the rest of the options. Good luck! 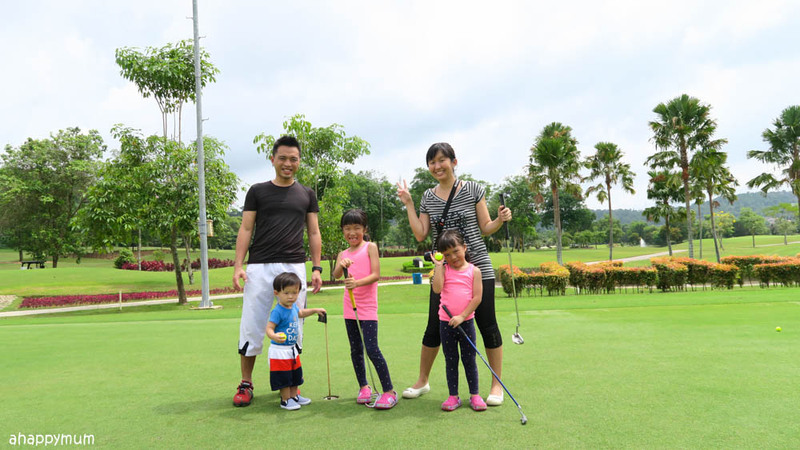 Disclosure: We received a media invite from Radisson Golf & Convention Center Batam for an all-inclusive 3D2N family stay. All photographs and opinions are my own. I would love to let the family enjoy the various facilities in the resort and keep them occupied with activities away from the screen. Thanks for the hard work in writing it in much detail+ a video! I look forward to the Kids Club for my 2 kiddos (5 and 2), and the Zoysia Spa for the wifey and I! Looks so fun! Glad you guys enjoyed yourselves! Am looking forward to a short getaway again after the intensive regiment of school especially when the eldest had just started Sec 1 this yr. school and work had indeed kept many weekends packed. We hardly have had time together to do the stuff we used to do. I super look forward to the massage session and definitely a short getaway for a great family time! Looking forward to just relaxing and taking it slow with the whole family! Been rushing around all day long since school starts. I wan to just relax and enjoy with my kids. And I Love the view! I look forward to finally being able to travel! Especially to Batam, which is not too long a journey for my young kids! 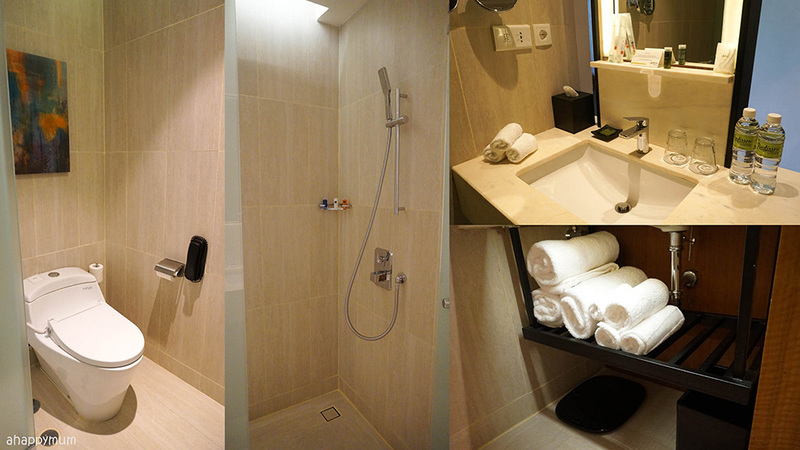 And of course, to enjoy the facilities provided by Radisson! Nothing beat family time away from the hectic lifestyle. Wish to win this so we pampered and enjoy ourself at this lovely resort. We have been there and enjoyed our short stay at the same resort. Hope to be given another chance to win this and go back to visit the lovely place and people. I look forward to spending some quality family time together as my husband works long hours. 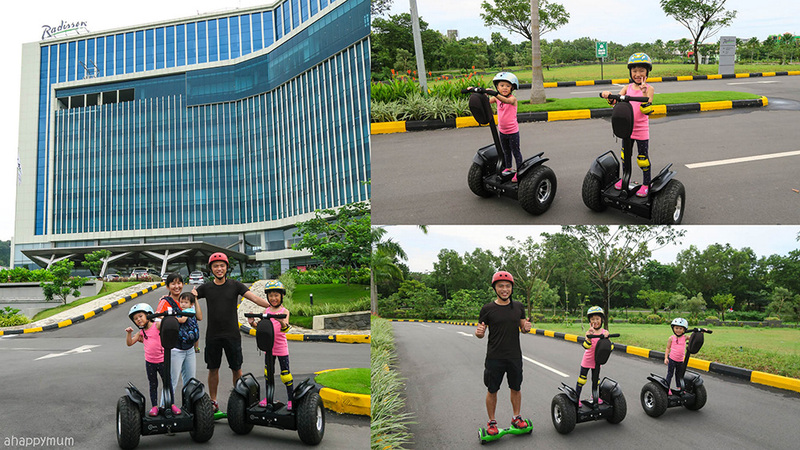 I wish to do all the activities mentioned especially the segway with the family. Looking forward for a relaxing holiday with my family. We would love to try the segway and hoverboard. Looking forward to a family bonding trip at this awesome hotel! Looking at the description from your blog, my two little monsters will sure be extremely happy to explore this hotel! Moreover there is the couple spa for me and my house that old Man to relax! Hope to win this giveaway! Looking forward to try the segway and hoverboard. A weekend gateaway without planning a kids friendly itineary sound great for me hahaha. Looking forward to the spacious , well equipped and kids friendly stress free resort! Finally no need to lug a big luggage for the kids! I wanna try the segway ride and archery with my family! It feels much like a fun adventure staycation, with the sun, the sea, and with so much love! Spa for the adults & all of the fun activites for the kids! love to have some ME time at the spa. While my girl and hubby can have a fun time with the segway. We never been to Batam before and this will be a good exposure for us if I ever win. The activities and facilities look great for families! The spa, the pool, the kids club, the golf, the segway etc. But what I'm looking forward most is having the opportunity for a quick getaway with the hubby and 2 children as it's not easy to fly with 2 young children! Hi. Nice holiday. Actually planning to bring my kids for a holiday since we have not brought them out for this yr. For my #1, it will be her 1st trip after my #2 joined us. So for #2, it would be his 1st trip! Looking forward to try the Segway. What an awesome review! Kinda "pai sei" to say I have not been to Batam before and I'm already in my 40s, even though Singapore is so so so near to Batam! 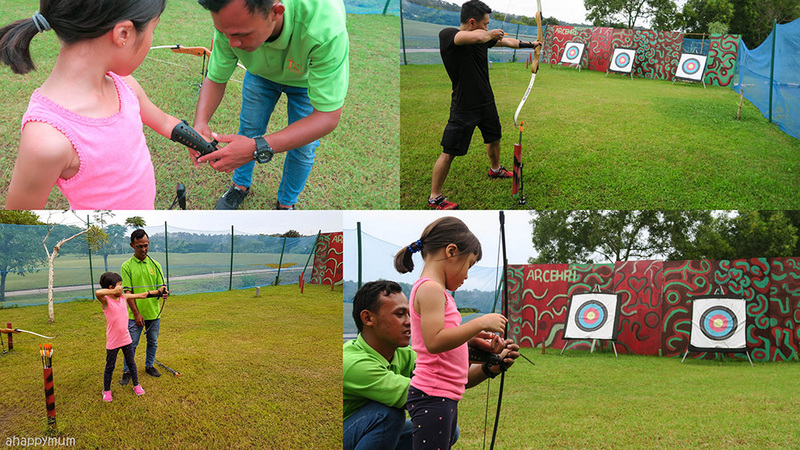 The activity that I look forward to the most in Radisson Batam is Archery. My kids have always wanted to try out Archery and I'm looking forward to the fun game with them. I believe this will be a great bonding trip, with so much activities to do with the kids, plus a spa treatment which my wife will definitely love to bits. Hope to win my maiden trip to Batam! Looking forward to a quality family time.. Looking forward to win this package and relax with my girl as a post-PSLE getaway! I could already visualise her scooting around freely on the Segway and hear the Spa calling out for me! Ha! I love the idea of a short staycation to soothe the restless spirit of mine! Looking forward to try out all the facilities you had mentioned in Radisson. Batam is a good place to bring my toodler to try out a short distance trip stay first before other places. 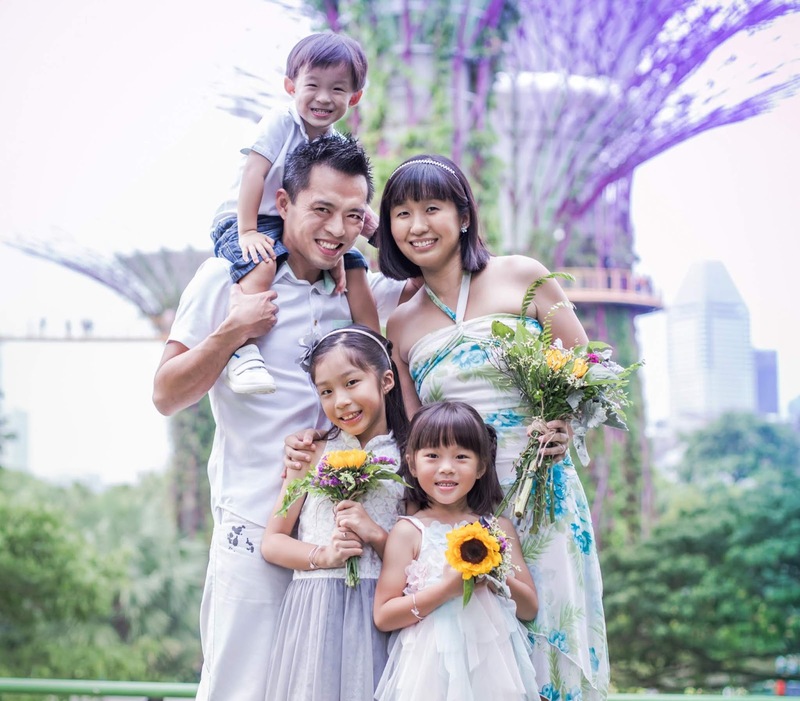 Hope I'm the lucky one.. Would love to win this lovely family trip package for a relaxing holiday. Keeping fingers crossed! Hope to win the short trip. To reward my mother in-law for looking after my son for these few years. And also to have a good bonding time with the family as well. Wow, your trip to Batam sounded so fun and eventful and really makes me wanna visit too. So hopefully I could win the giveaway and whisk the family to a short and relaxing getaway. Besides, my kids and their Daddy play golf too, and I think it would be great for them to bond over a game of golf. Would also love to try the spa and get some couple time like you and your hub did. 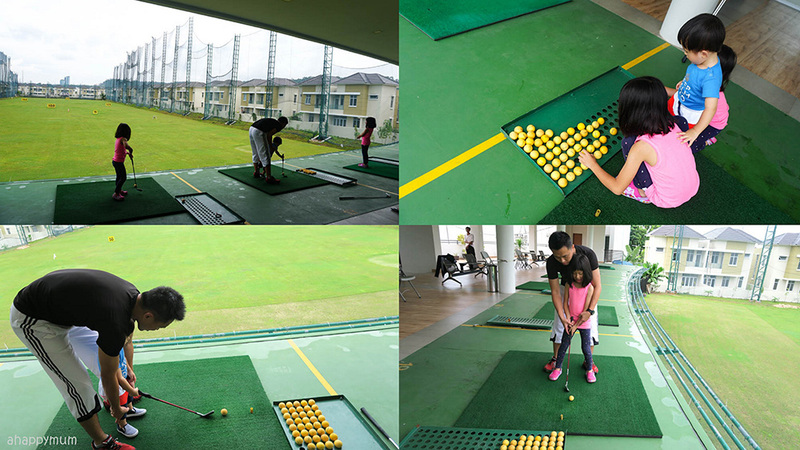 Saw the picture on the blog never know that there is such a fantastic place for kids especially the Golf and archery. Would love to bring my kids there to gain some experience. Hope to win this to bring the kids for a getaways since they never travel to Batam before. They will be delighted! Definitely need to extend to 3D2N! Segway and the infinity pool will be top of my list! Looking forward to the ferry ride my son has been longing for. Something he has not tried before. A good bonding time as a family since the daddy has been spending his weekends working. Thanks for sharing this nice hotel Radisson Golf & Convention Center In Batam. Hoping to win and bring my family to enjoy the nice Facilites. 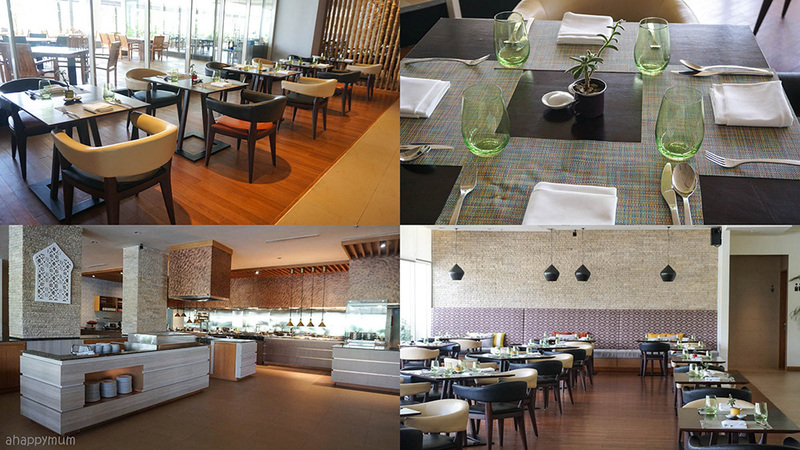 Radission is very kid-friendly and family-oriented. There is so many activities to keep each and everyone of us occupied. I look forward to the spa and food! I hope I can celebrate my birthday in Batam in this September. 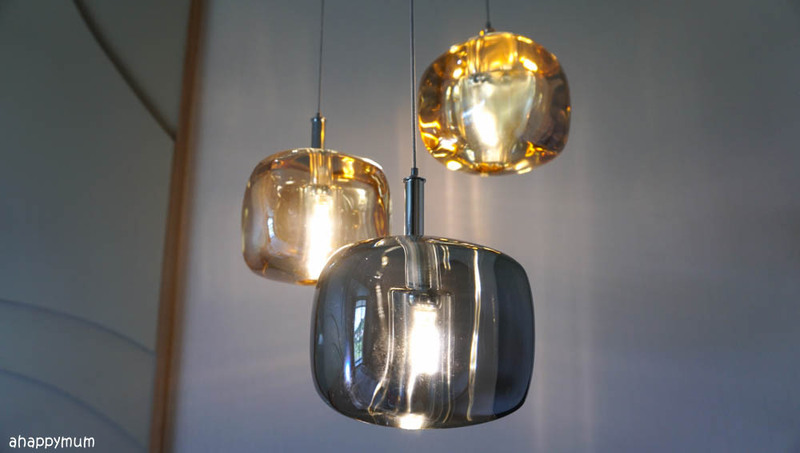 Hi Summer, thanks so much for the detailed write up and sharing such good stuff with us! My husband and I have been looking around for a fuss free holidays since we have two young toddlers (2.5 yo and 1.5 yo respectively). This exclusive giveaway will be a dream come true for us. 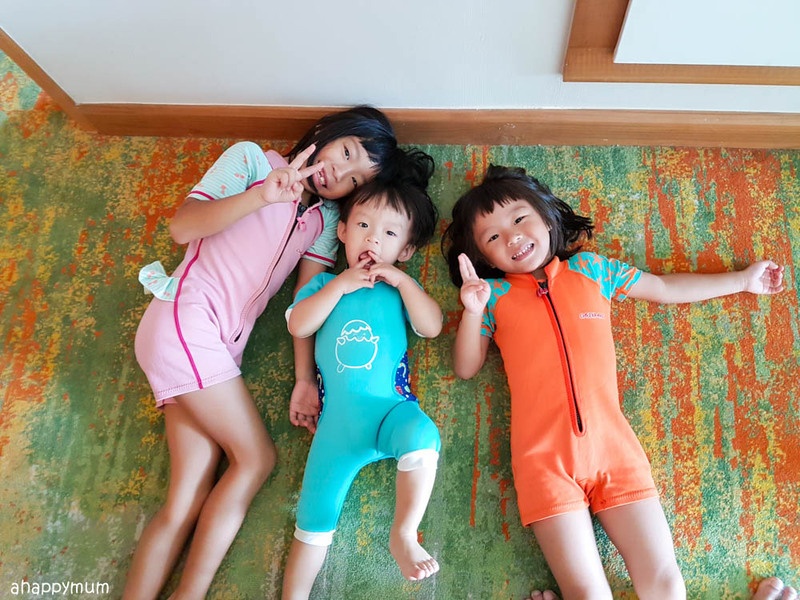 I like the simplicity and tranquillity of Radisson Batam and the facilities such as pool, Kids Club and Segway that my kids will certainly enjoy. Personally, I will be looking forward to the couple spa experience. The last time that I did couple spa with my hubby was eons years ago. My girls like water play so the pool is definitely a plus point for them to stay at the hotel! Hope to have s mini vacay out of Singapore. 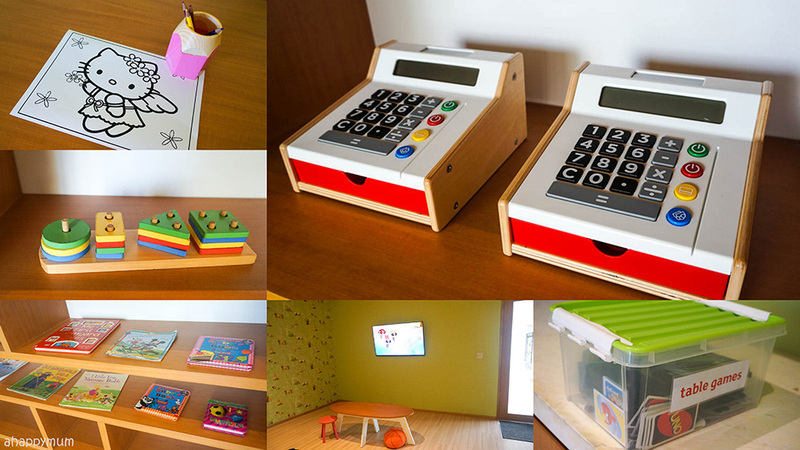 Wonderful kids-friendly place for family! Hi happy mum , thanks for sharing .. wow great staycation ... hope to spend some time with my family and little girl before the 2nd one pops in nov .. I'm sure it will be delightful getaway for my family . What a great getaway and amazing giveaway. It's wonderful to know that it is not too far away from Singapore. Thanks for sharing and i really appreciate the details as "Mummies do worry alot" when it comes to holidaying with kids. Would love to hve some family bonding time. Hope to win it. Hi thanks for sharing a great place for family with young kids to have a short vacation. The pool will be a great place for me, my husband and my two boys to spend our time together! It has been a rough and tough first half of the year for my family. Glad that we are already into the 2nd half. We promised a wow!! Trip for my 2nd child before she she enters P1 next year. And Batam has never crossed my mind until I saw your video! Thank you for sharing this with us here! I hope to be able to bring the family (not forgetting my 3 minions of coz!) to Radisson. Once again, thank you for the giveaway!! Hope to win to have a short break and have s fun and enjoyable time with the family! Hoped to win this for a fun getaway with my family, thank you for the awesome giveaway! Hi, thanks for sharing the Radisson. Didn't know that holidaying at Batam can be so fun. 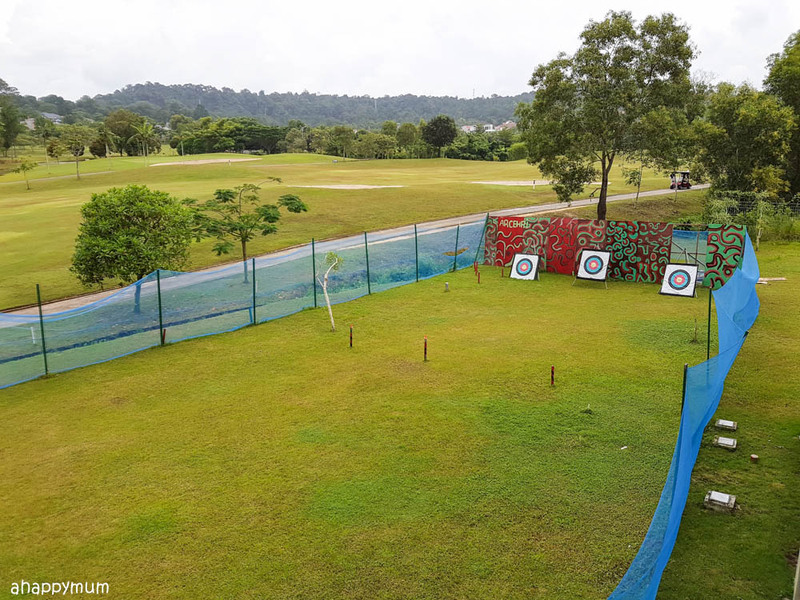 Looking forward to let me kids experience the onsite activities, archery etc. my family like this family trip package very much. it will be v.fun and happy vacation. Love the swimming pool and golf course view! Just beautiful to wake up to such scenery. Hi, thanks for sharing and blessing :) we just welcomed no. 2 into our lives a few months ago and we're so blessed. it's been hectic and non-stop, so this would be a welcomed break for our family. 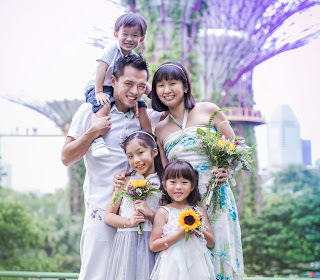 Looking forward to little adventures as a family and a short trip away from Sg is a good start! Your pics make me wanna transport the whole family there asap. Hope to be given this opportunity! thanks! Very comprehensive review! Surely look forward to the kids club! Wah very detailed review! Must have taken a Long time to write haha! Can't wait to try the hoverboard with the son and hubby :). And the massage too!! I am looking forward to try out Golf with my girl and she will definitely loves to try the Segway too. I'm looking forward to the fmaily time an also trying out GOLF with the kids. So look forward to the Kids Club for my little princess to have fun together! I look forward to have a short getaway trip with my family to celebrate our 15th wedding anniversary. Hope to win and pamper with a spa treat for being a stay at home mom with 4 kids without any helper. I look forward to trying out the Segway! looking forward to enjoy the swimming pool with my son together! Firstly, thank you for the post. 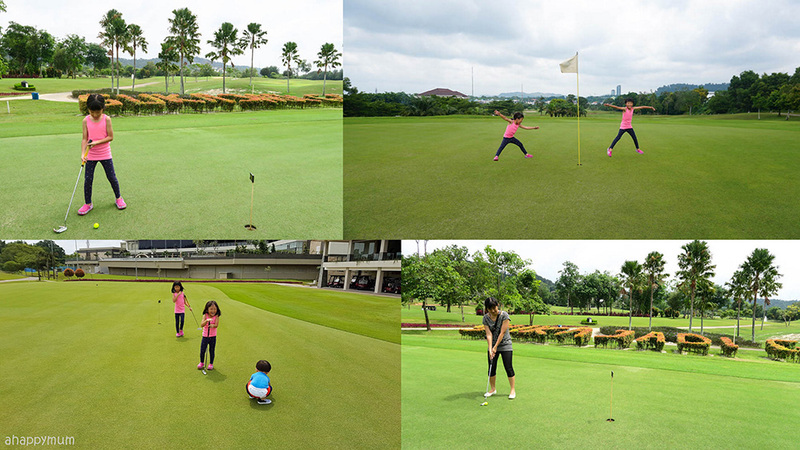 With the array of activities (and food) on offer, we (2 adults and 2 kids) would definitely extend our stay 3D2N or more. We look forward to a chillaxing time and making fond memories while experiencing Raddison hospitality. Only went once to Batam with my hubby before kids were born. It seems totally different as before, hope to win this trip to bring them to Batam for the first time. I look foward to Escape Remedy spa treatment the most. Surprisingly there's so much to do! It will be so memorable to win the trip for #myelly birthday on 8/8. Thank you for the awesome giveaway as always! Hubs can't take long leave off work. 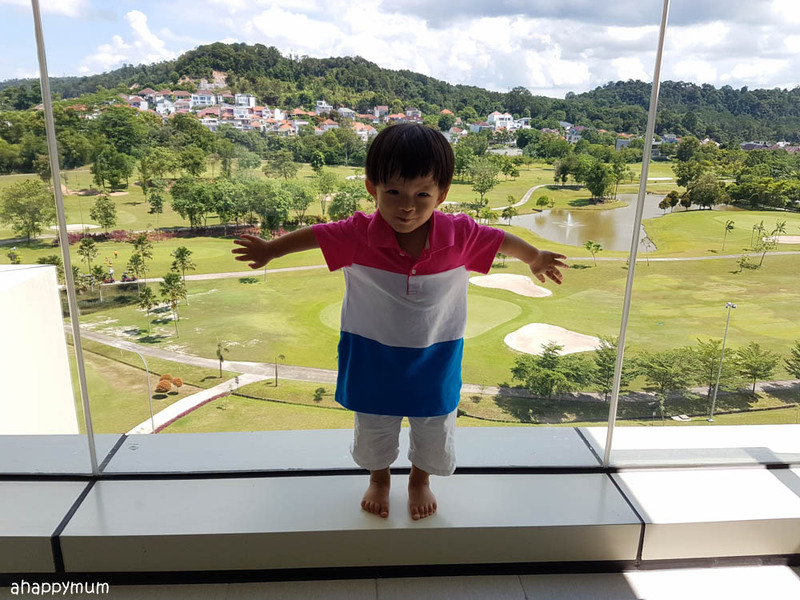 Batam would be ideal as it's only a ferry ride away, and Raddison seems safe and welcoming for my 2 young kids! 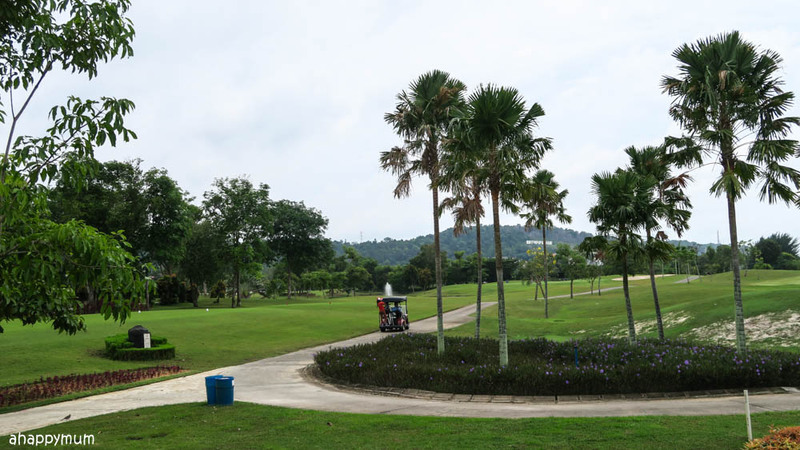 I most look forward to in Radisson Batam is to play golf! I'm looking forward to the exciting on-site activities, especially Smart Skate Board and Archery. They look fun! Most looking forward to enjoying some couple-only time at the spa. I so need a massage! I really like your photos of the view to the pool and driving range from your hotel room balcony. That would be what I am looking forward to - expansive views to water, sky and greenery. That makes my perfect vacation already! This is really a rewarding trip that me and my hubby as a couple can get to indulge in their massage with the couple room and the amenities for an indoor or outdoor pool are really the best activities that we and our 2kids can enjoy the fun with no worries of prayers for a good weather that certainly won't dampen our playing moods!! Can't wait to bring them to explore And let down my hair as a Mom and just enjoy with my kids with loads of fun and family quality time that we can venture!! Thanks so much for the detailed write up that I can't wait to pack my bag and go! 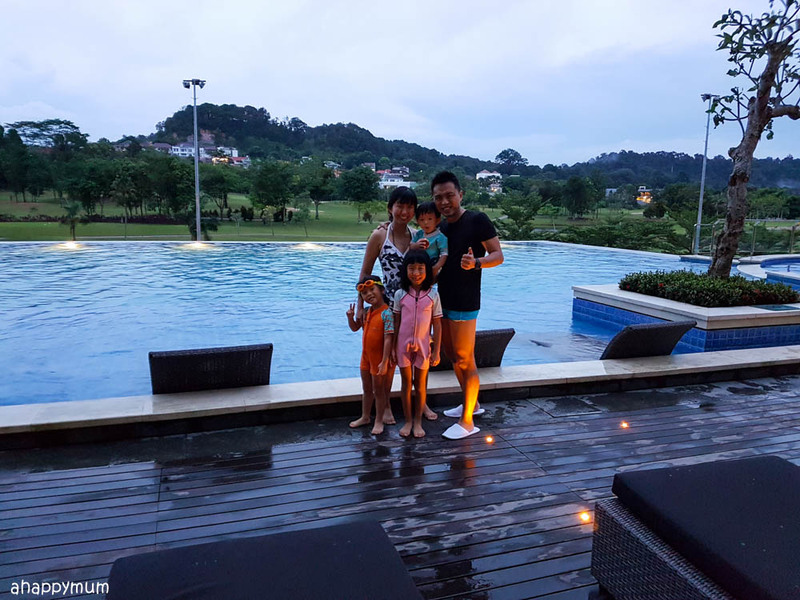 Getting to be out from the usual hustling and bustling life and spending a nice memorable weekend at our Neighbouring country Batam is certainly what I hope to get most from a true family bond with my Wife and 2little ones. I am Glad to be able to have this extra fun place that I can bring my family along . It's always nice to get out of the usual square box that they face most of the time and allow them to be up close with the greenery and bonding moments with us. Hope I can surprise my youngest Son for this nice holiday that we can celebrate his 3rd birthday . Thanks so much. 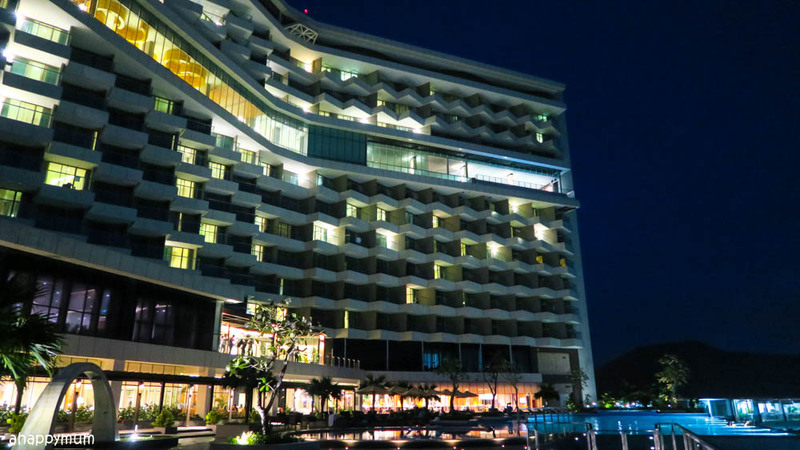 Looking forward to the huge infinity pool and pool facilities available at Radisson Batam! I am looking forward to the kids club for my 5yr and 3yr old kids. The massage is appealing to me too. So many funfilled activities at Radisson that will keep our family occupied and happy. It will be an awesome short getaway. I hope I can win this getaway as I desperately need a break away from my stressful work. I have been travelling quite frequently for work and hope I can win this to have an enjoyable moment with my entire family. Really looking forward to the pool as it looks just so relax, the room looks so cosy as well! hoping the kids can try out golf too! Looking forward to the food and the activities that we can enjoy together.. and it's not to far away too. 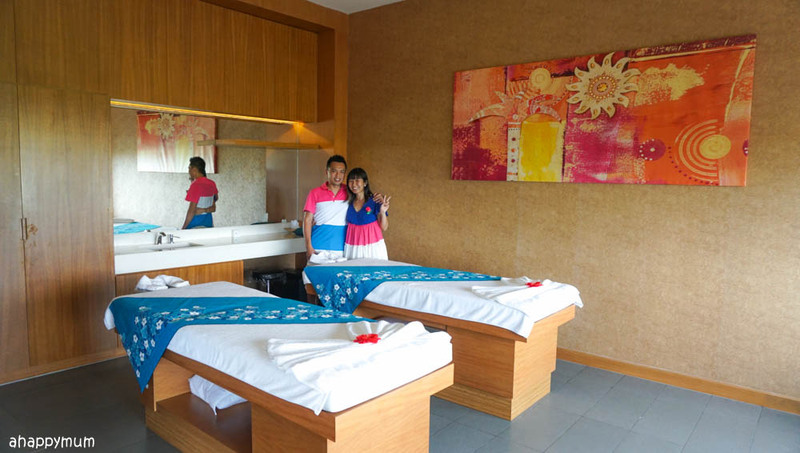 What I look forward to most in Radisson Batam: Couple spa at Zoysia Spa! The best beach getaway with family,we massage junkie to relax and rejuvenate. 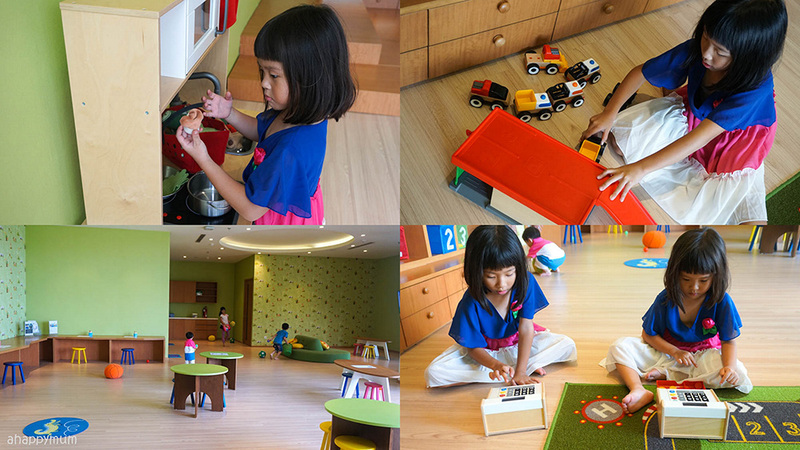 my kid will love with kids club provides alot fun activities. It must take a dip in swimming pool. Looking forward to have the full body massage and also infinity pool. Will be definitely a great relaxing trip! Love to look forward the food and pool in Radisson Batam. My little girl never take a ferry before, hope to let her know how fun it is. I have never been to Batam and hope to give a chance to create lasting memories for my hubby and girls. For them to keep for the rest of their lives. I'm looking forward to the infinity pool for my toddler who loves the water even though he cannot swim and the golf course and driving range for me and my family to experience. We stayed in Raddisson before in London and Switzerland so it would be a cool experience to be able to try this one that is just a ferry ride away! Our family always cherish family getaway. If we do win this giveaway. I will be looking forward to enjoying a spa sessio n with my husband while children hangout at the kids club. Food is another thing our family always look farward to. 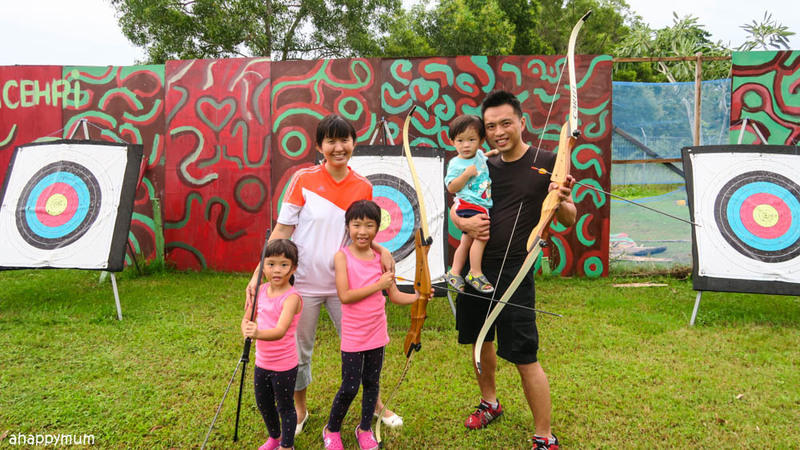 This will be a great opportunity to try the massage as a couple with my hubby, as we have never tried it before and definitely love the archery and Segway tryouts with my family. A new experience, and at the same time, build confidence in them to try out new sports! I will be looking forward to the couple spa and all the fun activities for the family. The pool and Segway will definitely appeal to my girls! For myself and hubby, we look forward to the spa session and also some quality time with the girls. I look forward to spending quality time as a family regardless of whichever activity we participate. A mini getaway is much needed for my husband, and us, who had been very hard at work for the past few months. He didn't have much opportunity to spend time with us. My child just started attending childcare and that marks the end of my SAHM time. Wish for an opportunity to spend some quality family time together before I return to the workforce. And look at that SPA, I cant remember when is the last time I stepped into one. 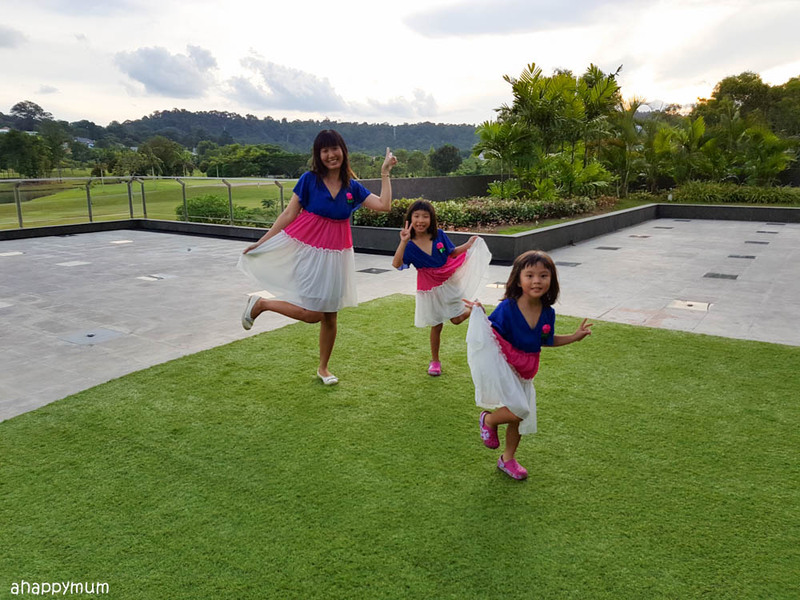 The blog post on this hotel is really enticing and makes us wanna go and play as a family, esp since my girls are learning golf. Thanks for the detailed write up. I am looking forward to stay there. I have not been to a spa, I am very keen to try it out, is a good break for mummy while the kid enjoys at the kids' club. I look forward to the Zoysia Spa for me and hubby as well as a well deserved get away for the family. I most look forward to trying out on the golf activities. I looking forward most the massage and relaxing spa for my wife. Best part is there are kids club and swimming pool for kid! ^_^ Hope to win this for our 10 years anniversary. I will be an awesome hubby and super daddy if I bring the family to this vacation! Thanks! We would love a staycation just to take a break from the crazy bustle of our lives with our two littlies and dog. 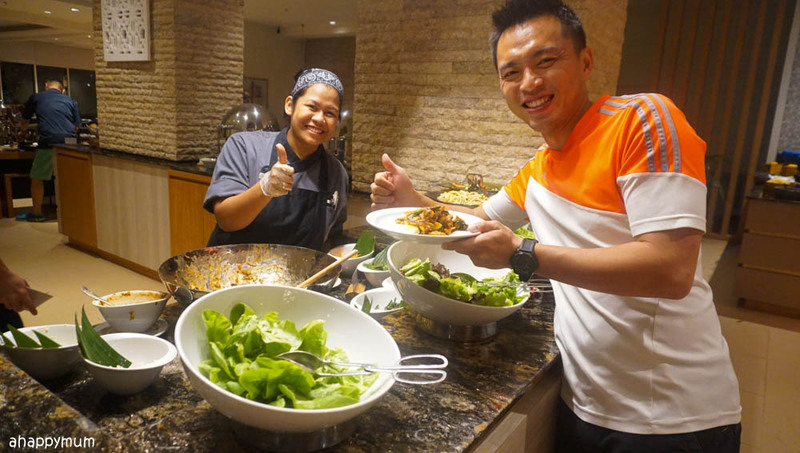 Sounds like a dream - good food, fun activities and spacious hotel rooms. It looks like a much needed respite from the hustle and bustle of the city! Would be great to unwind and relax with a massage at the spa and spend time by the pool , a first holiday for our family! 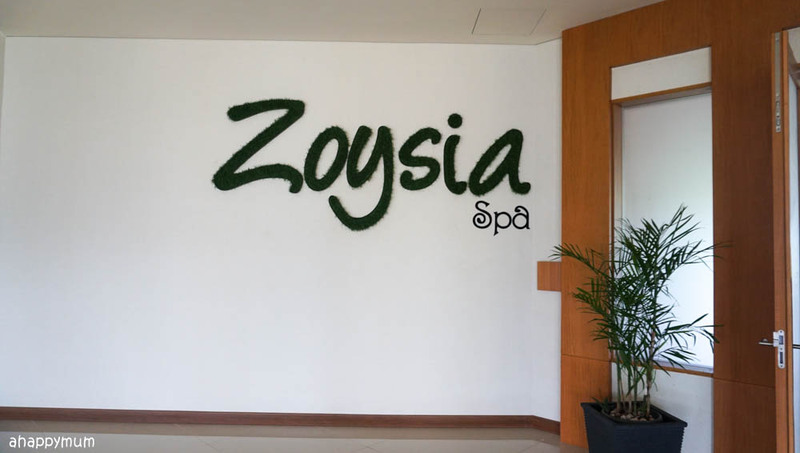 i looking forward to the Zoysia couple spa and my boys are looking forward to having fun in the kid's club! Hope to bring my family for some fun as all of us have been working really hard, we always love short trip as it is less of a hassle and not too far from home! I look forward to the segway and hover board as our family loves exciting fun like this!